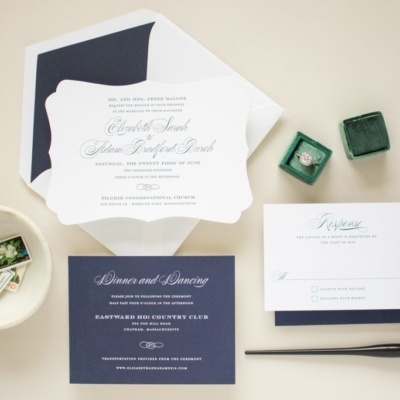 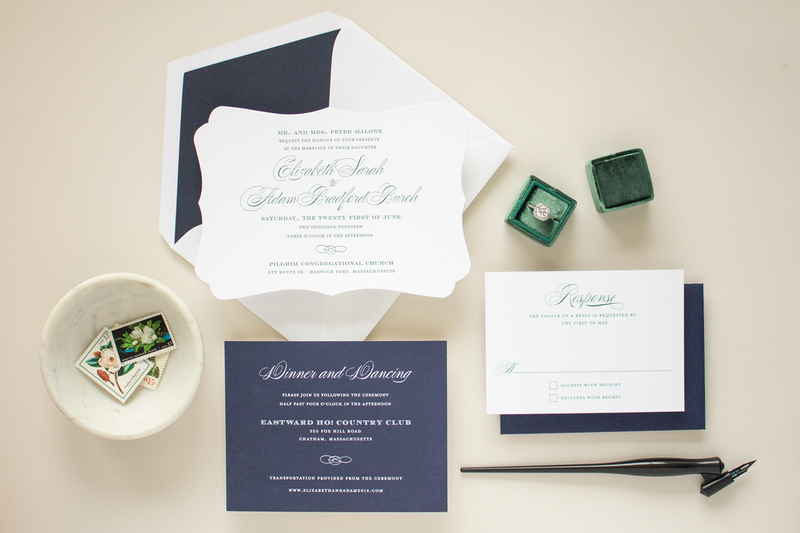 At Banter & Charm, I take a different approach to bespoke wedding invitations. 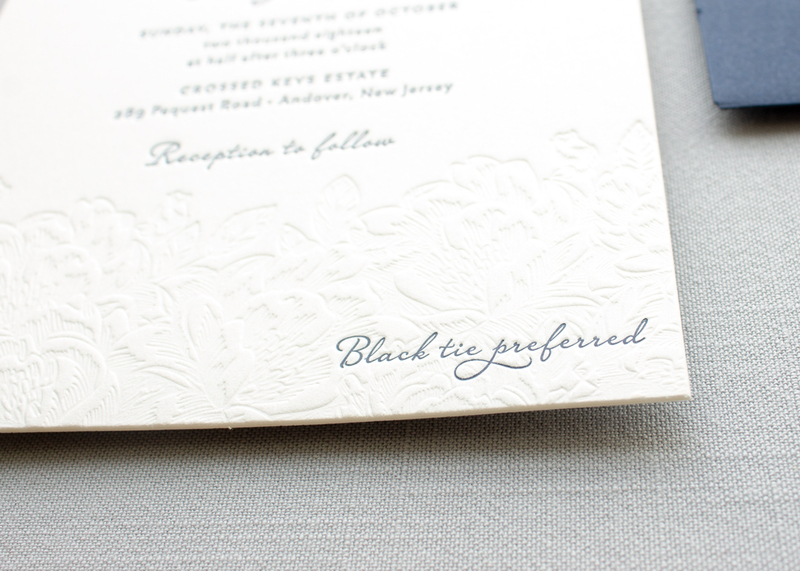 Every invitation in Banter & Charm’s wedding collection can be customized to perfectly suit your style. 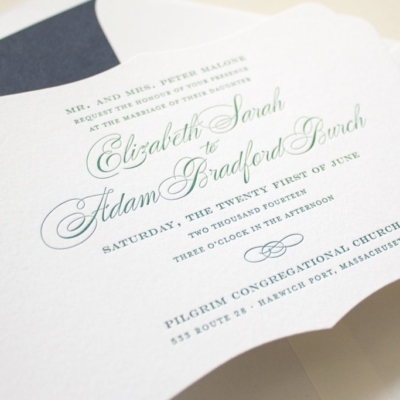 You can change the colors, fonts, wording, and paper – all at no additional cost! 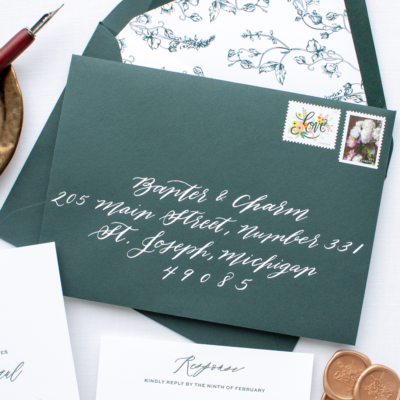 I also offer a variety of premium options like edge painting, calligraphy, and die cut shapes. 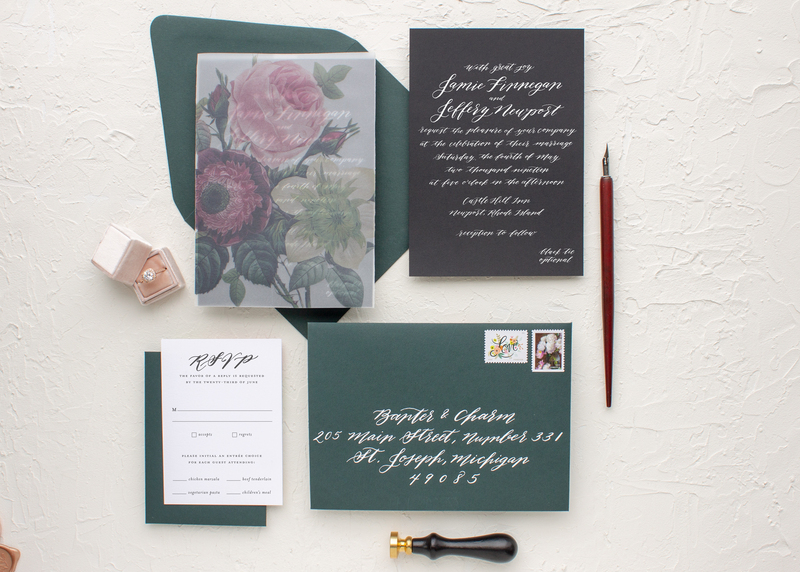 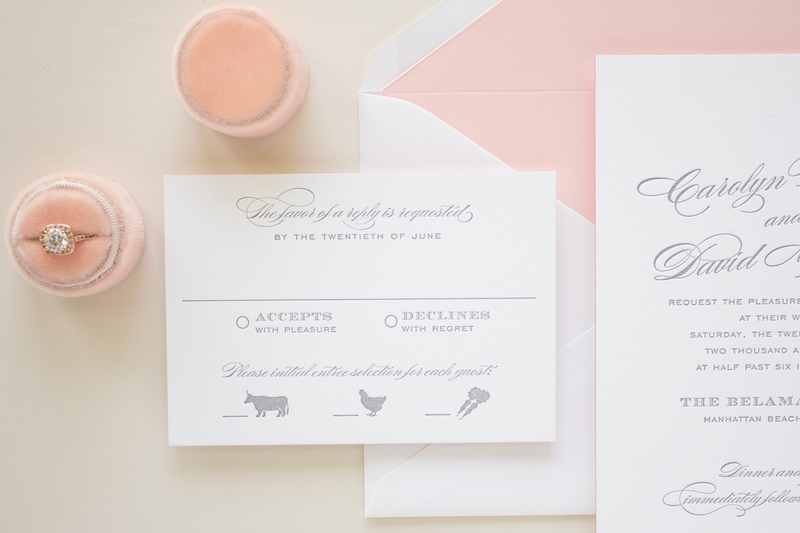 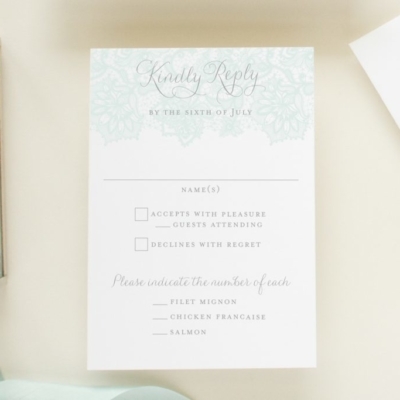 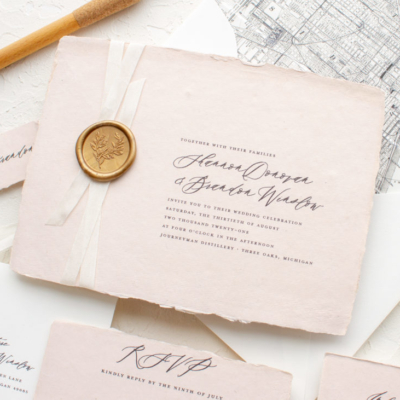 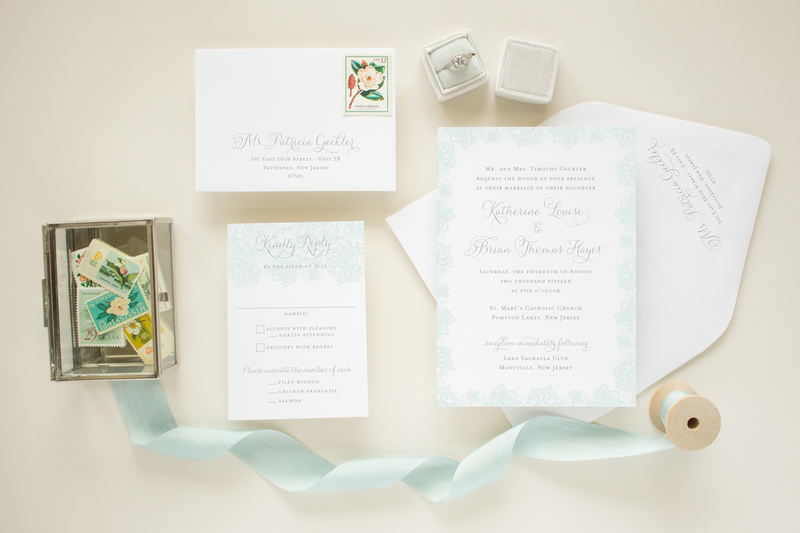 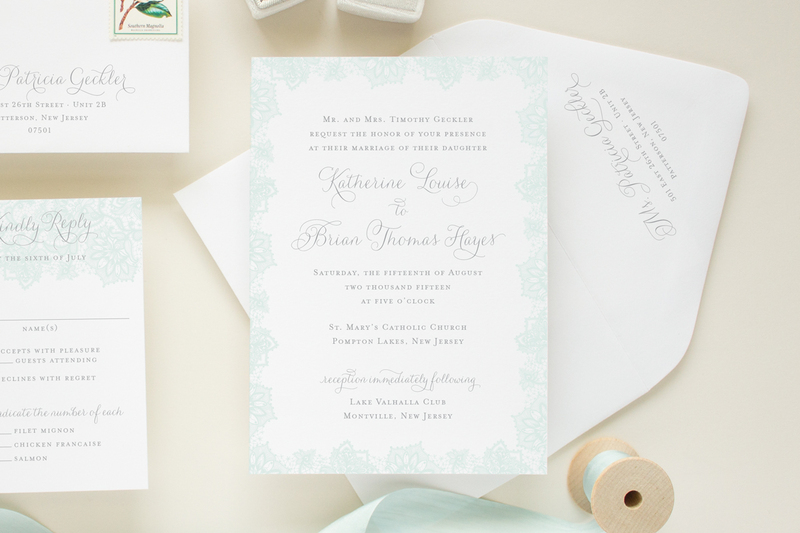 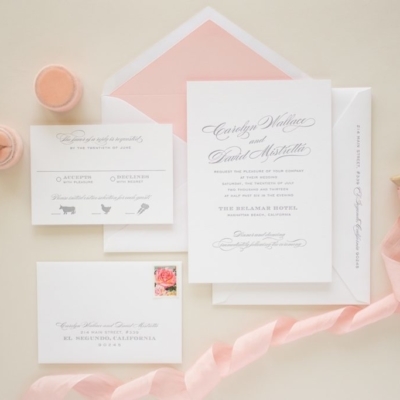 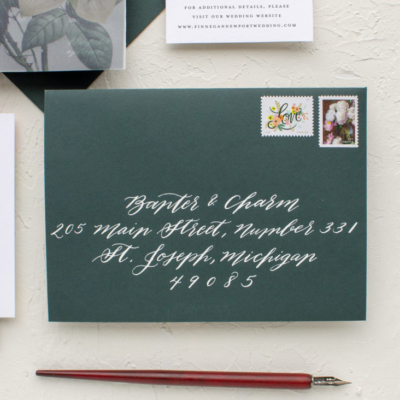 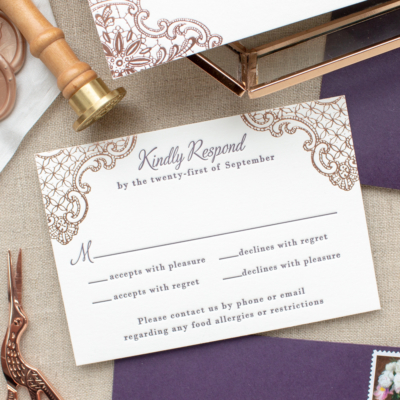 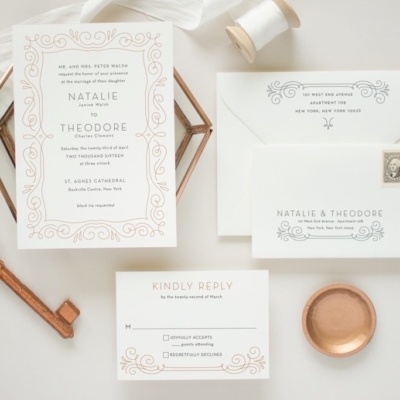 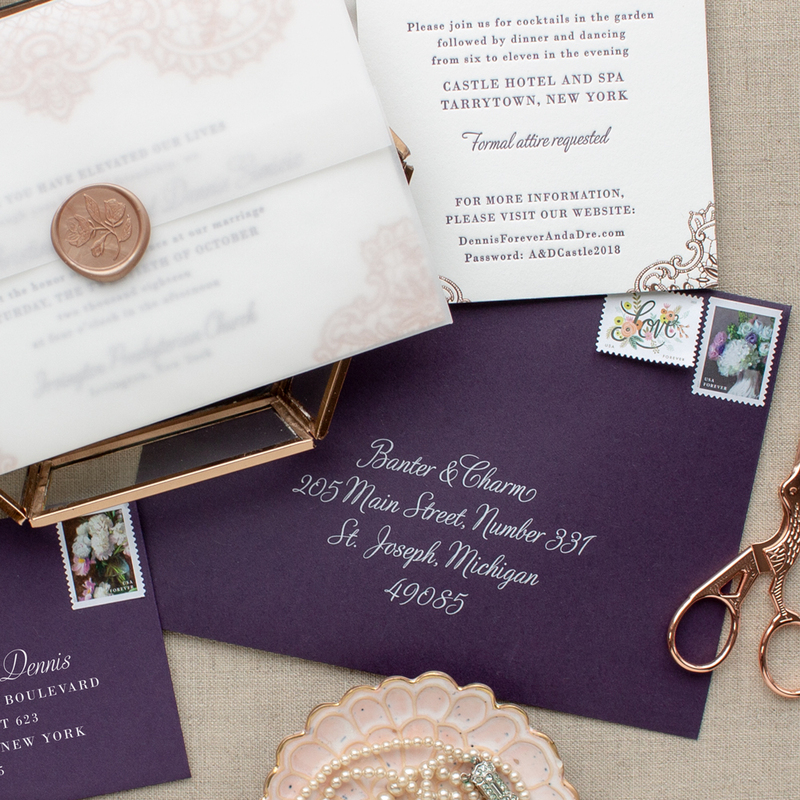 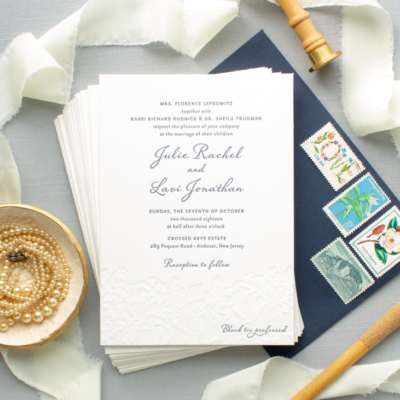 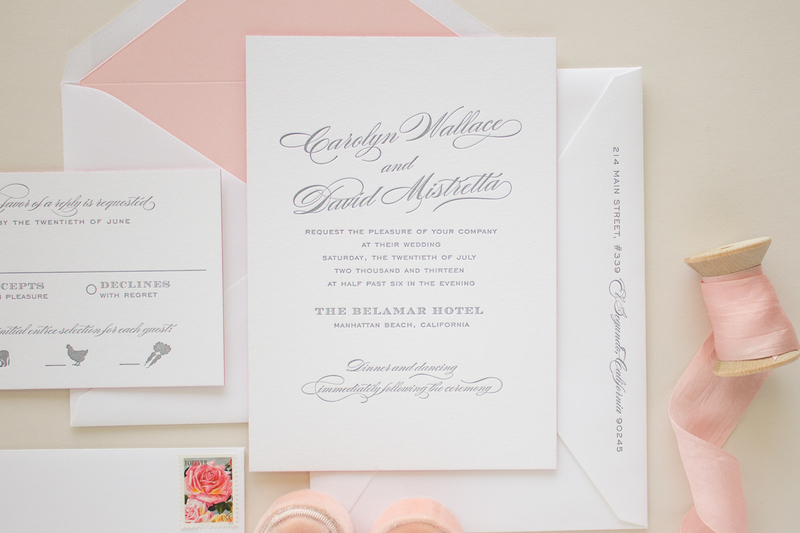 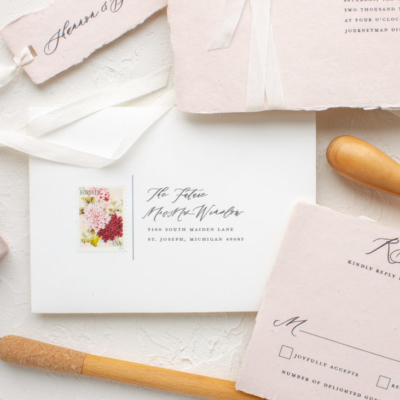 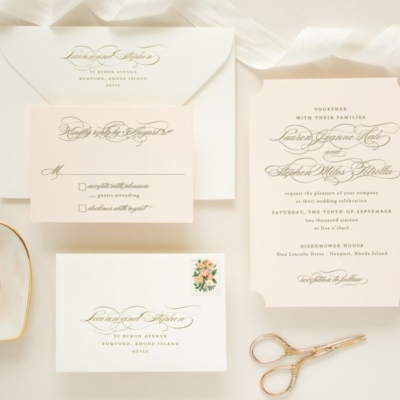 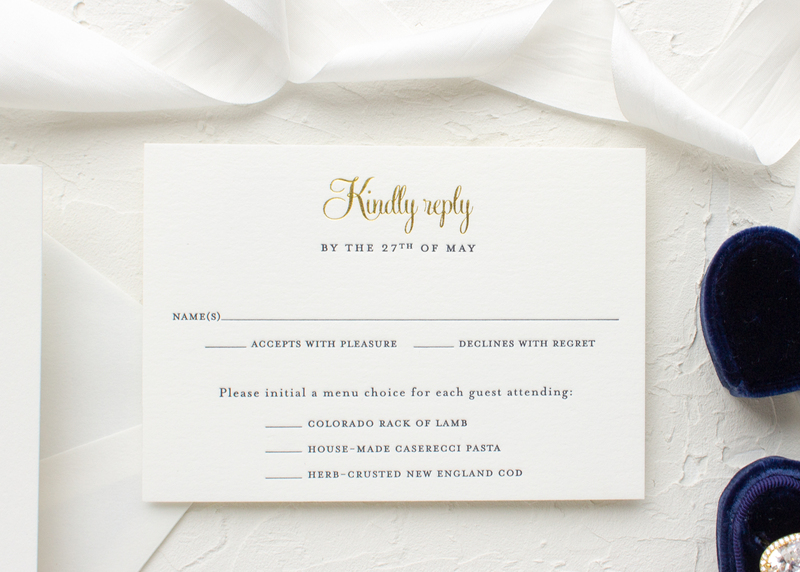 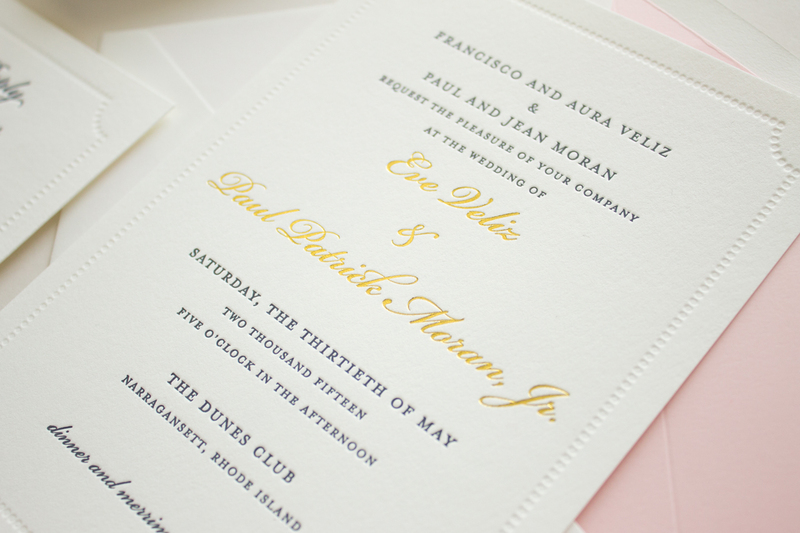 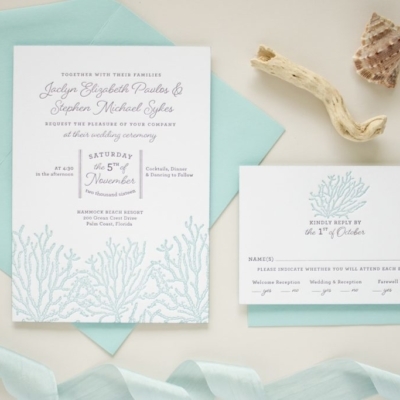 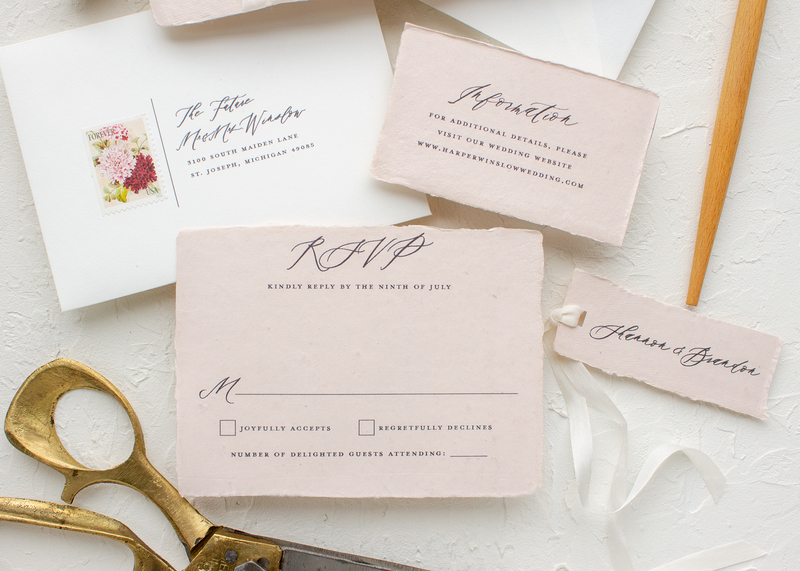 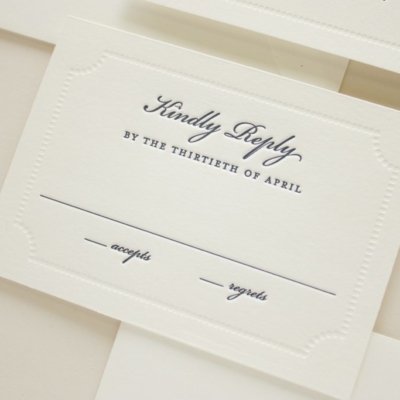 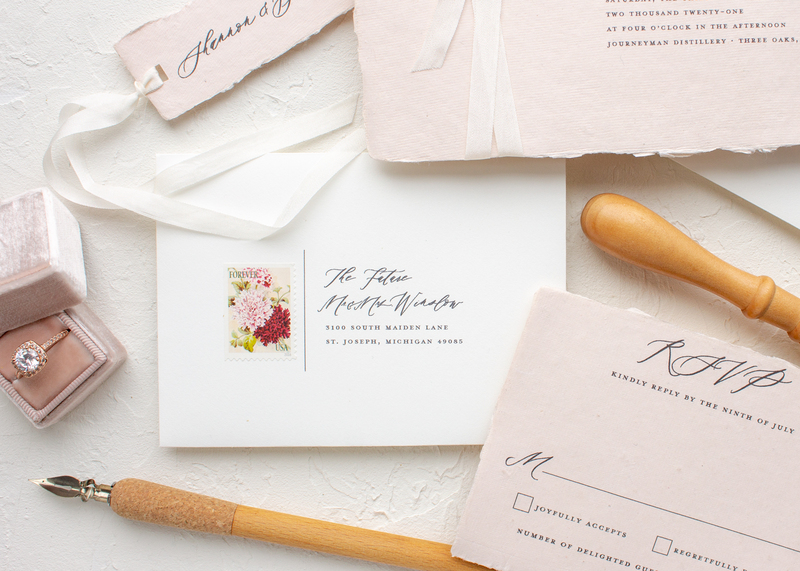 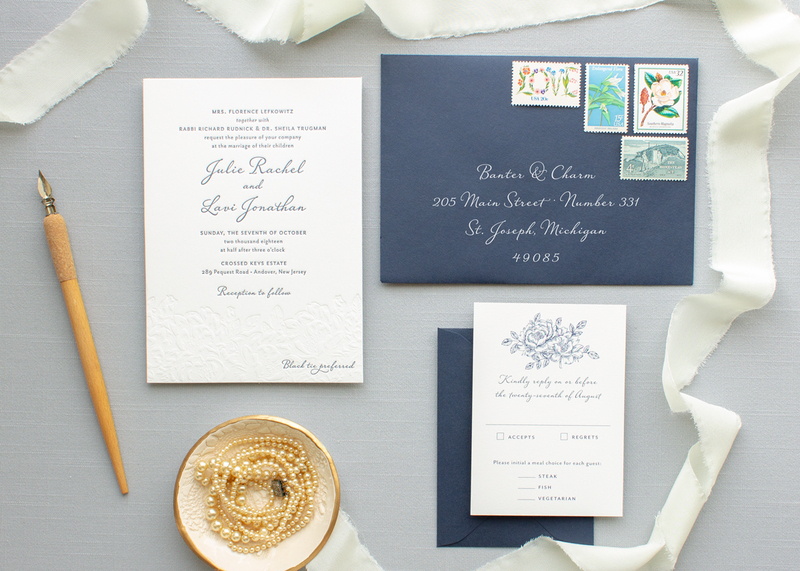 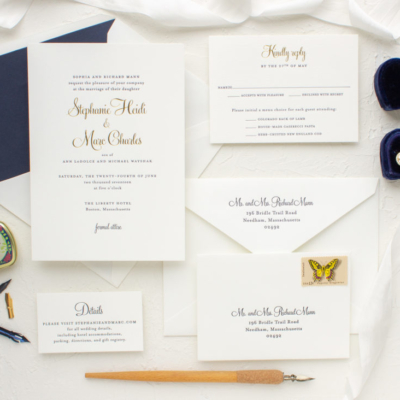 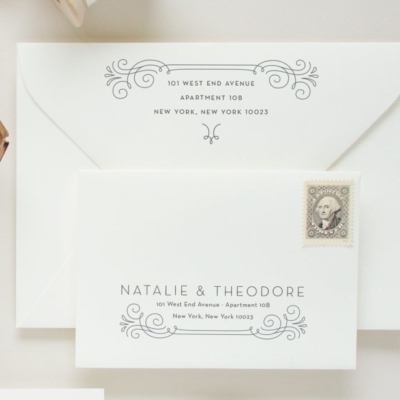 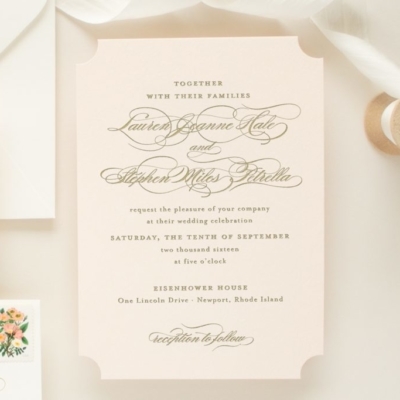 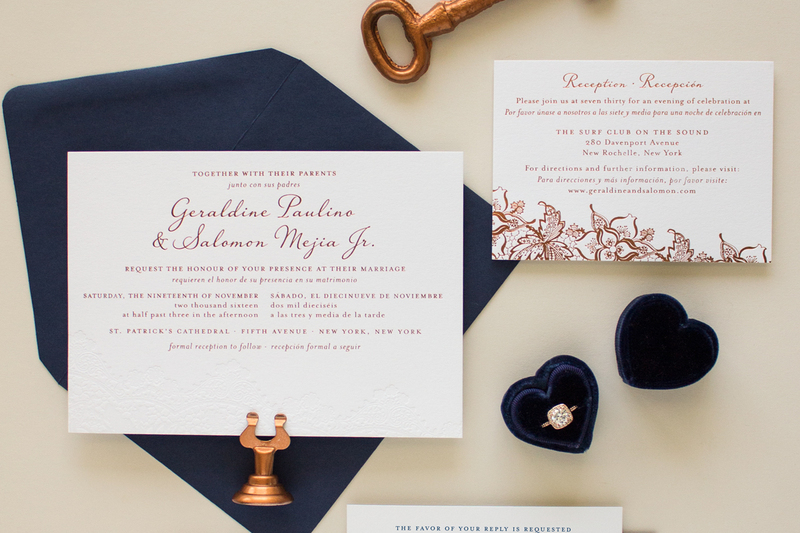 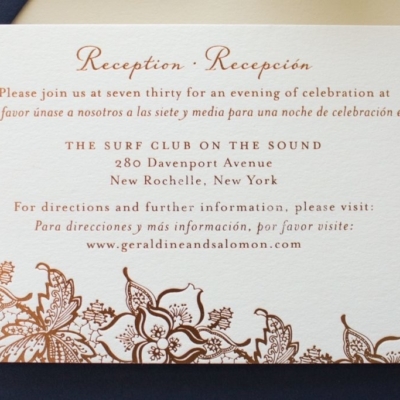 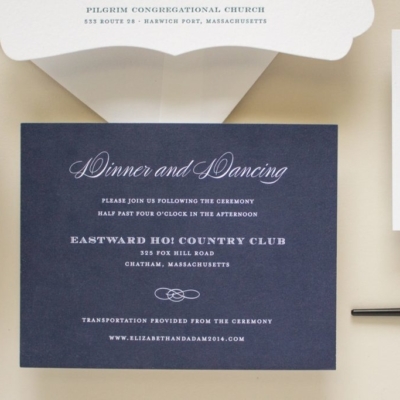 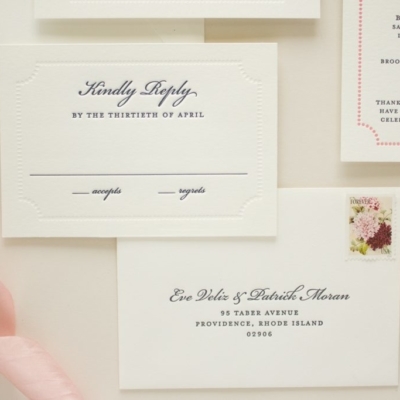 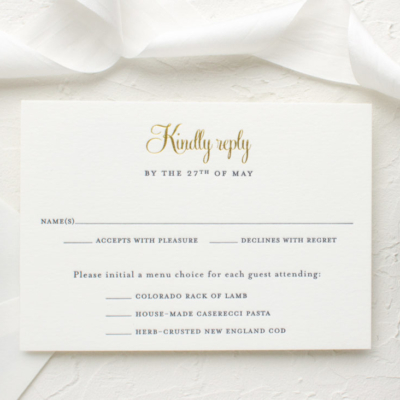 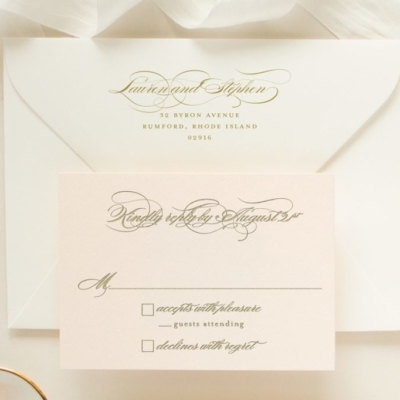 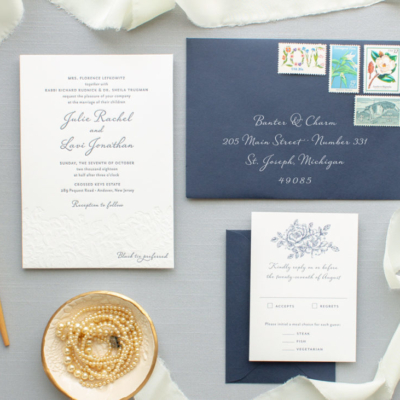 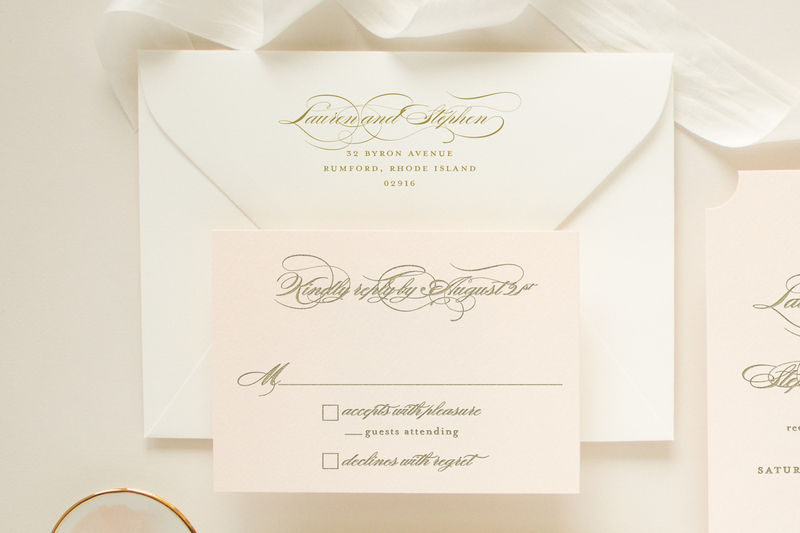 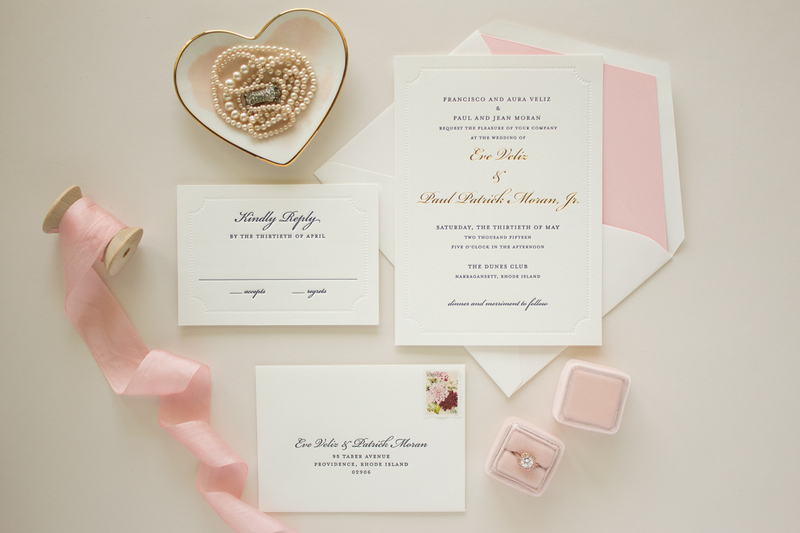 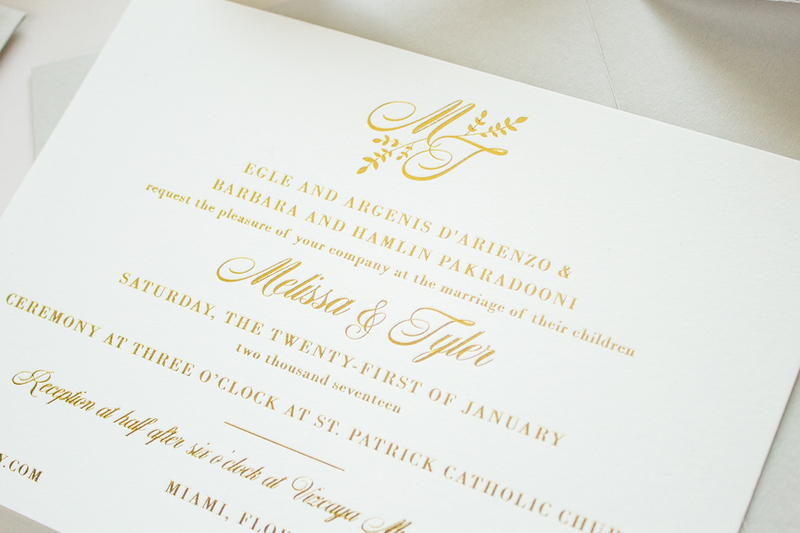 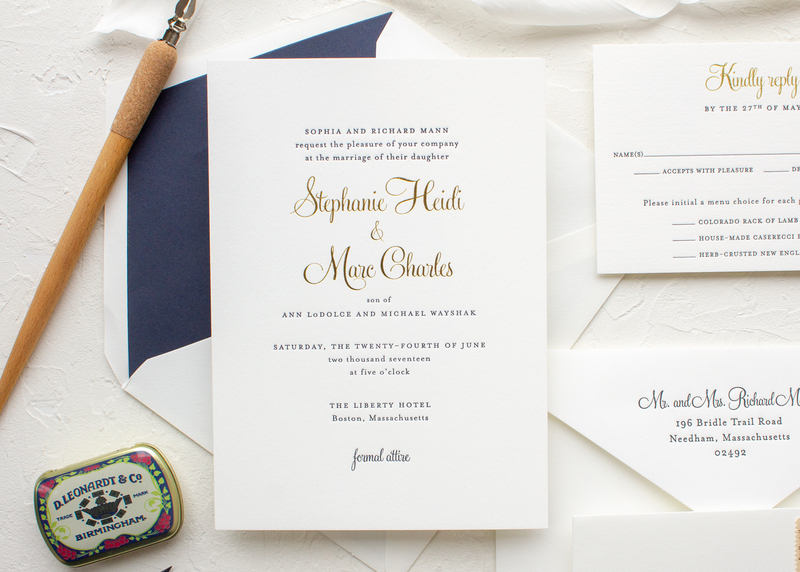 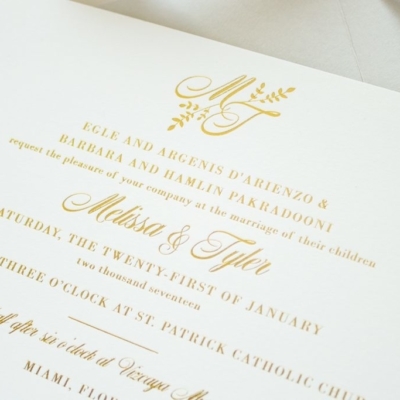 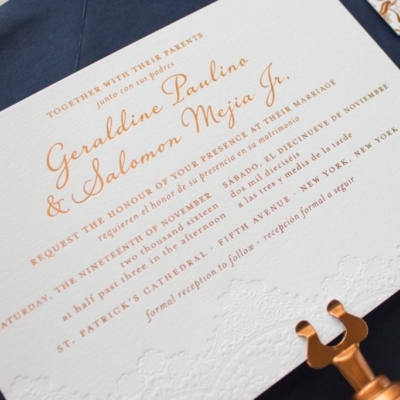 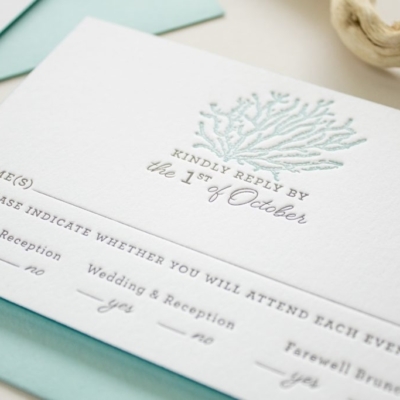 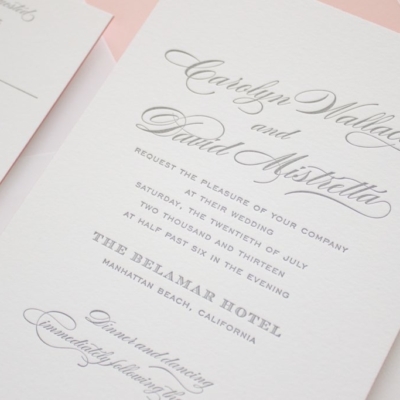 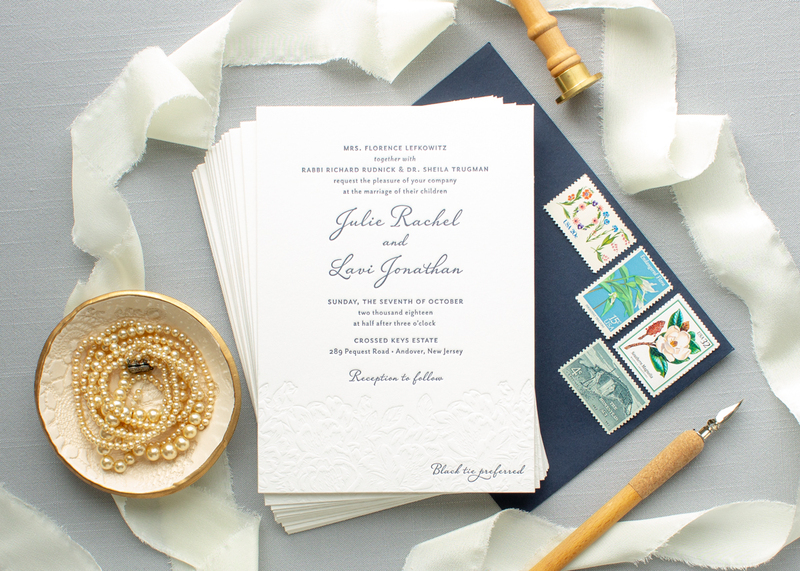 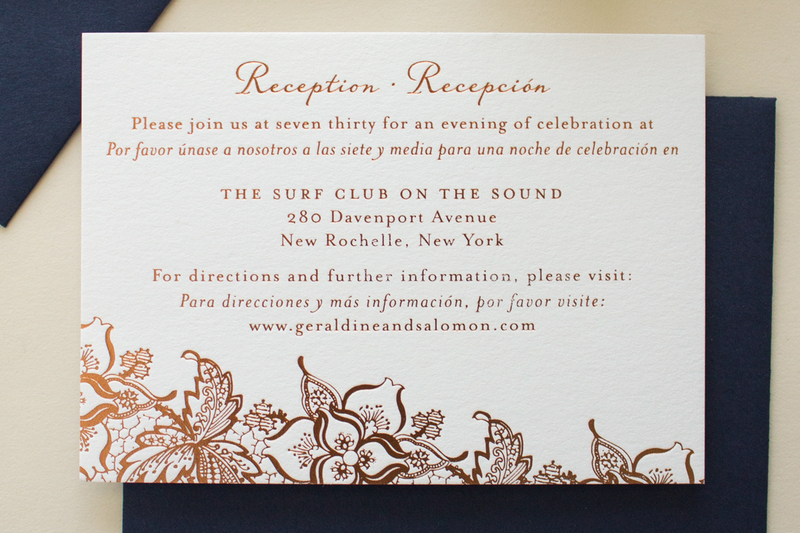 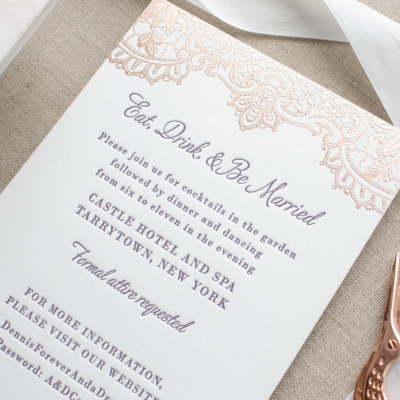 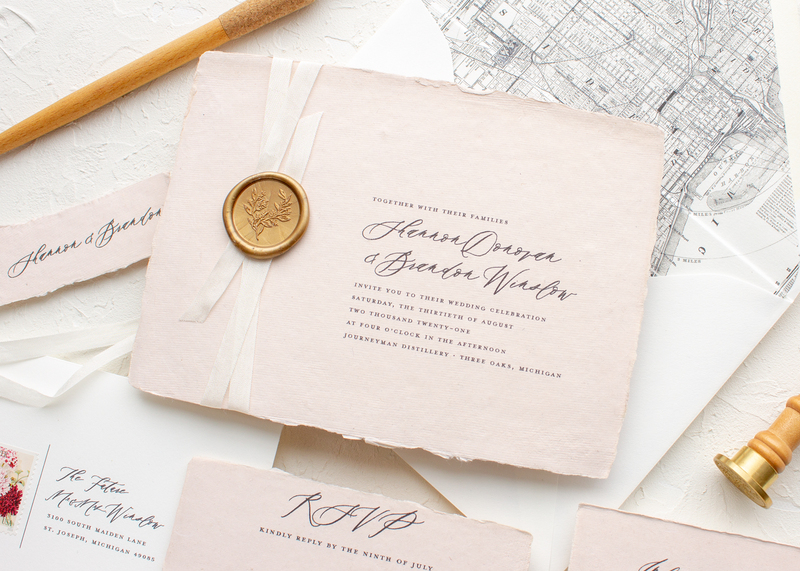 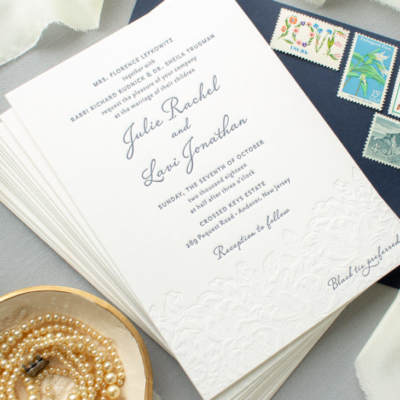 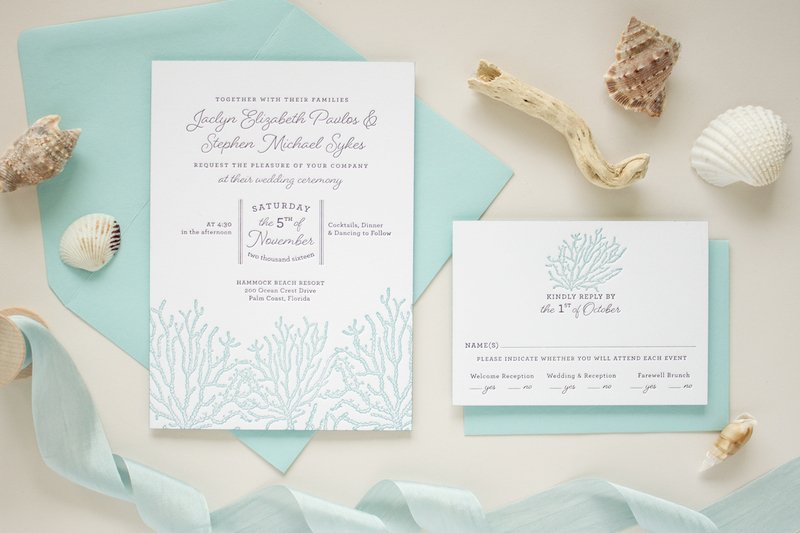 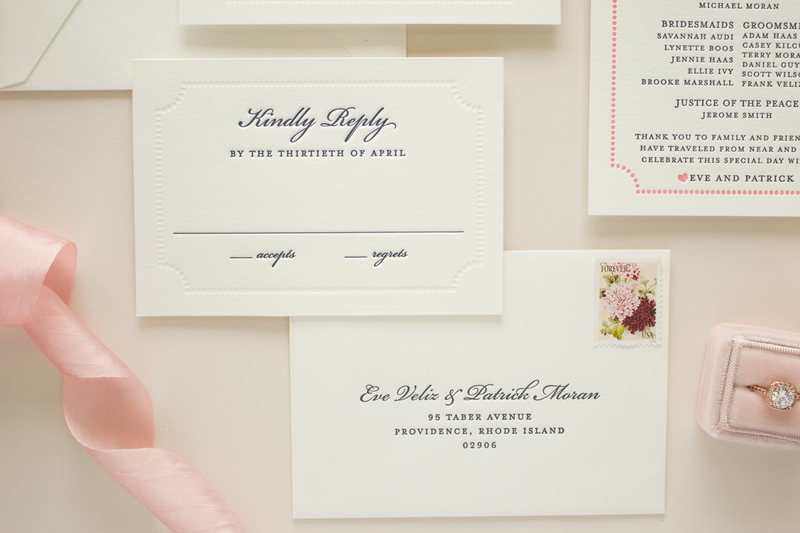 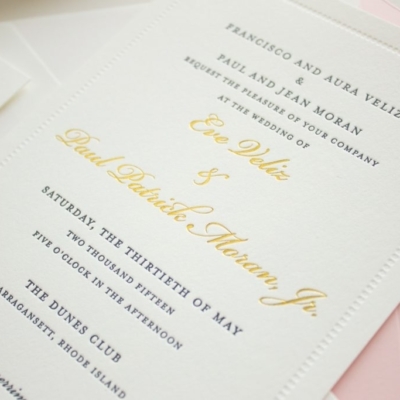 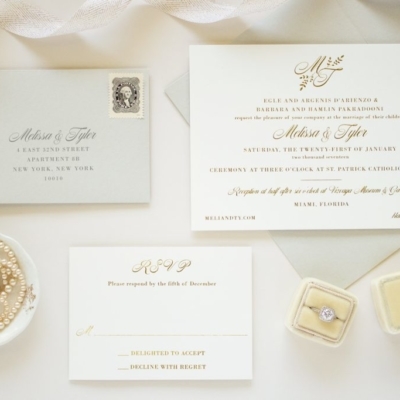 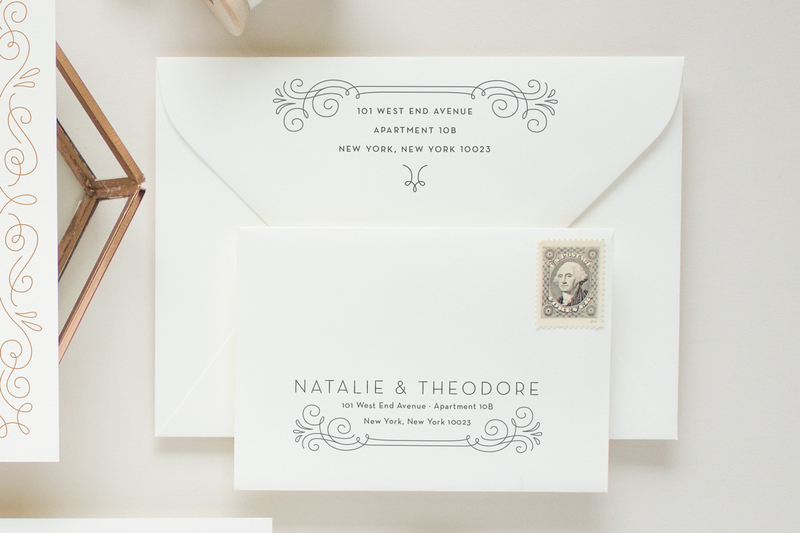 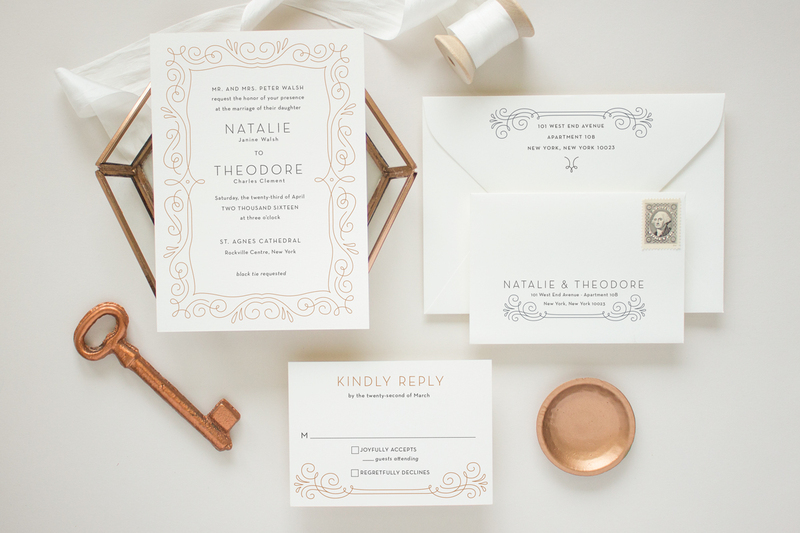 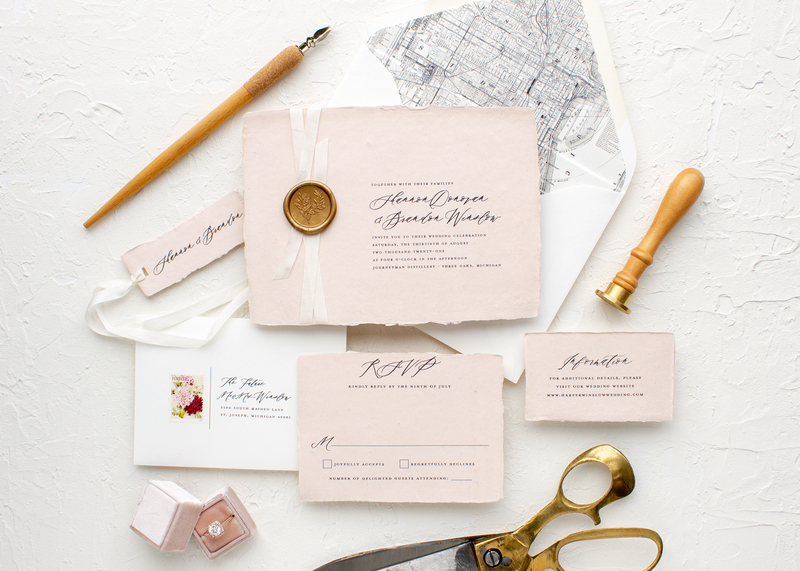 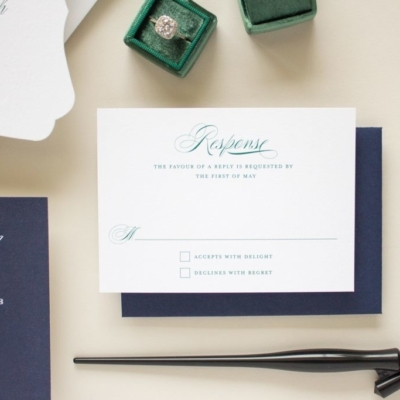 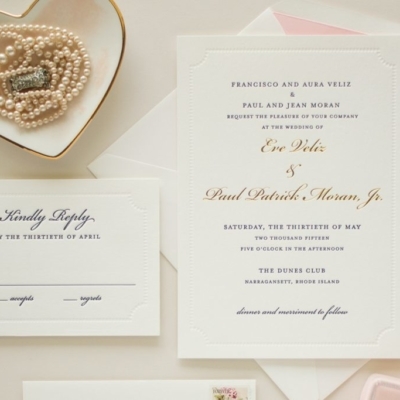 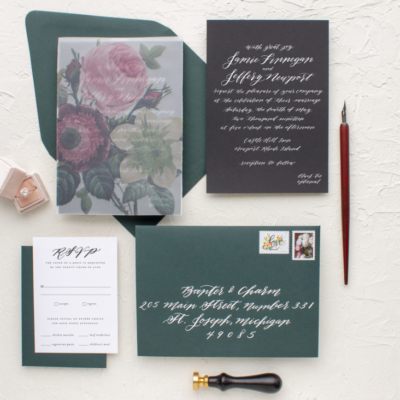 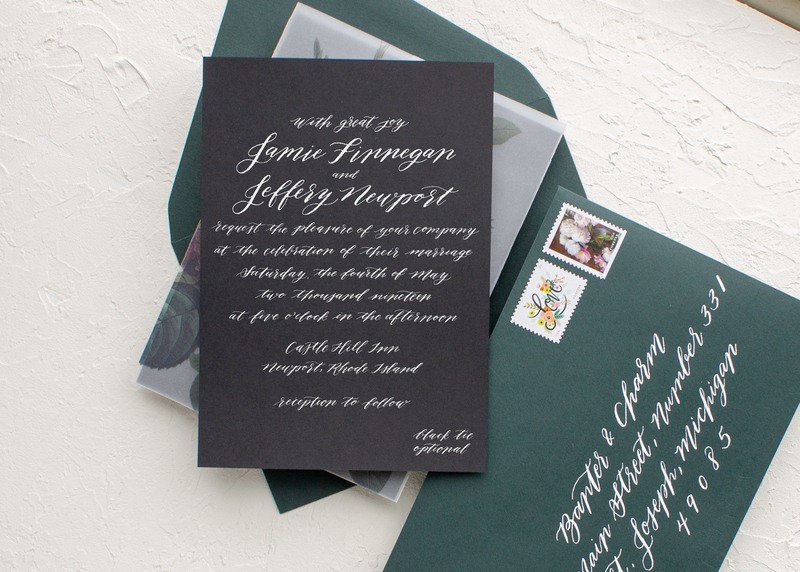 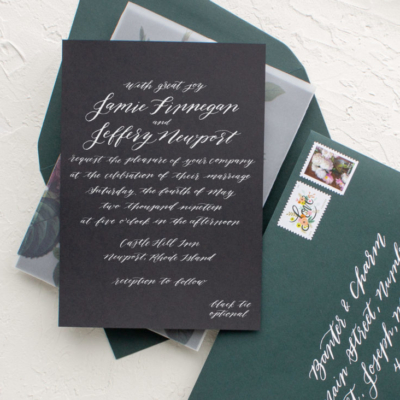 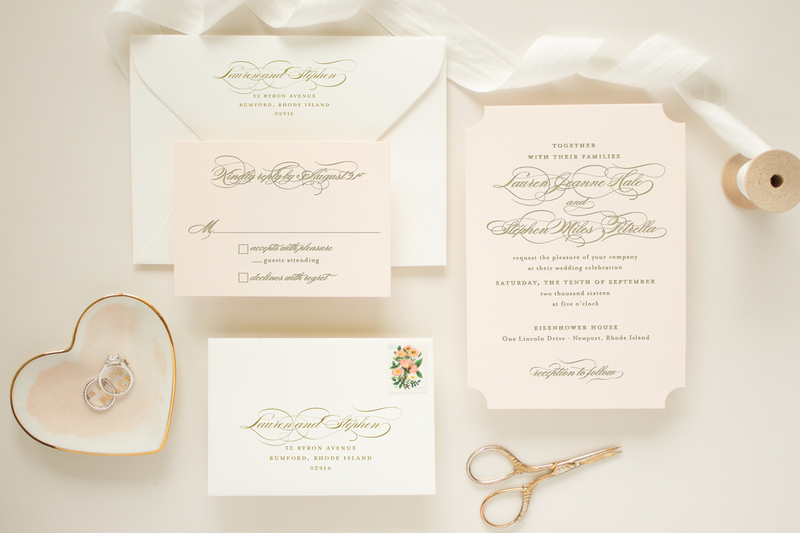 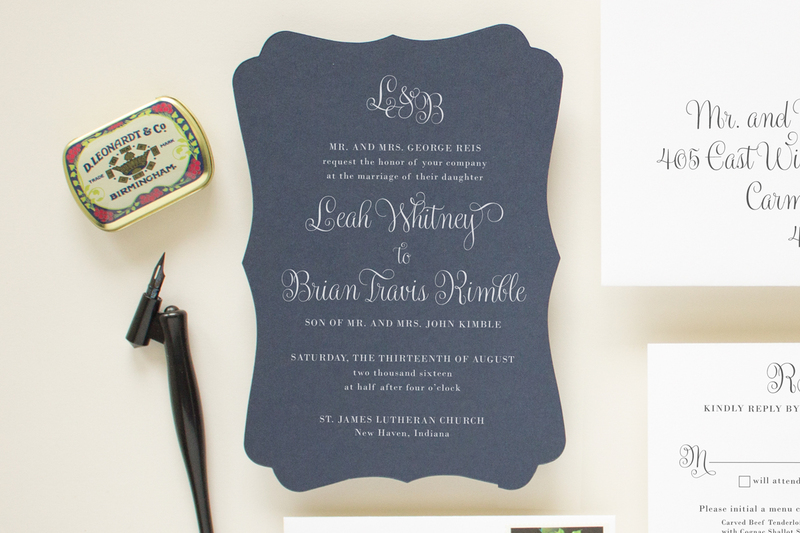 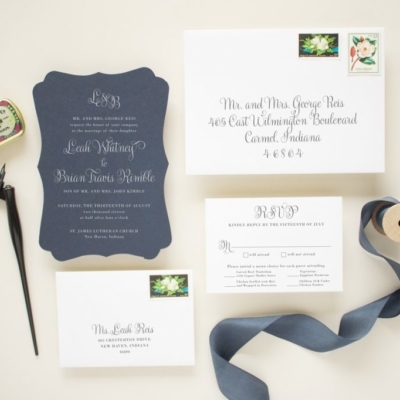 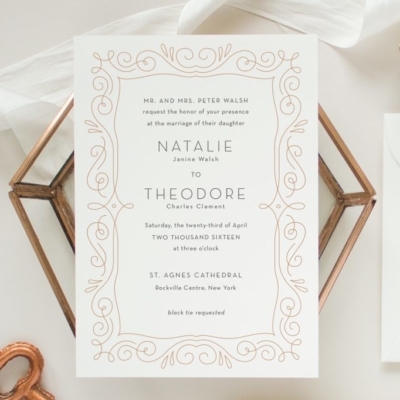 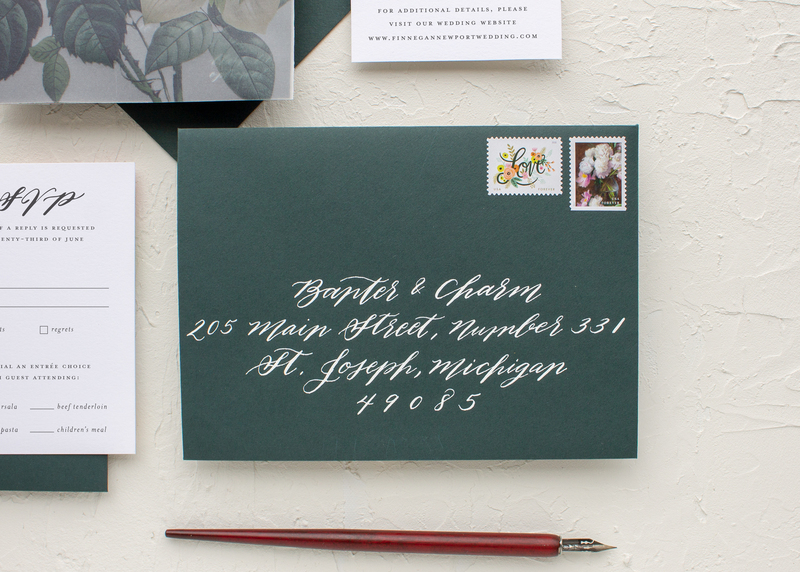 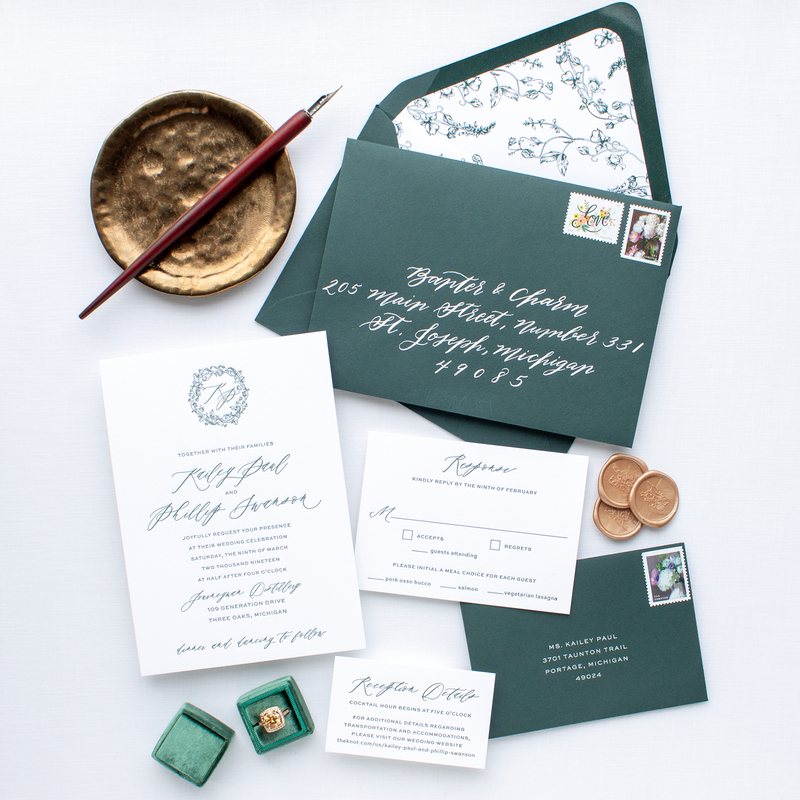 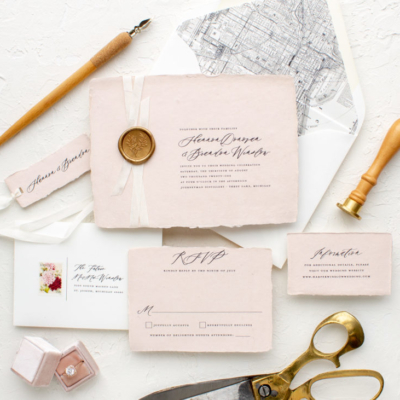 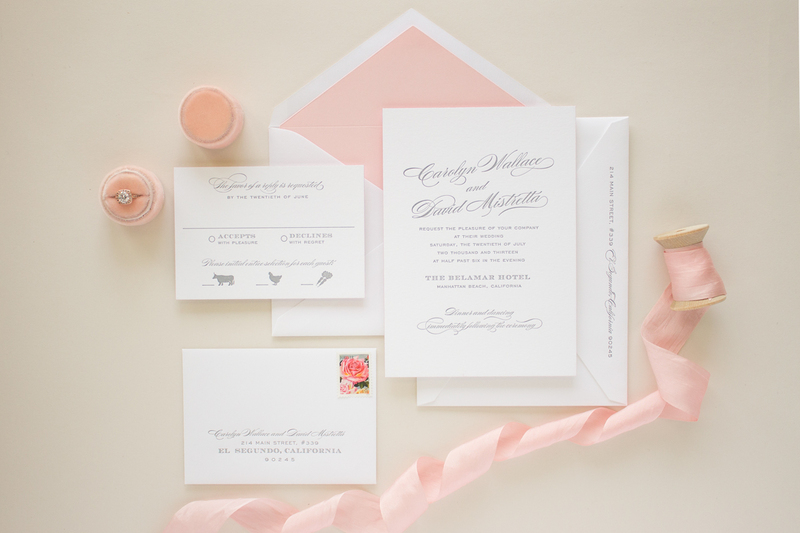 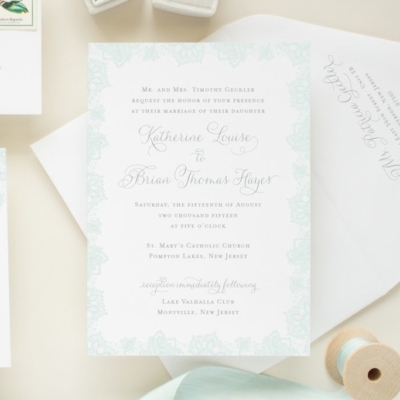 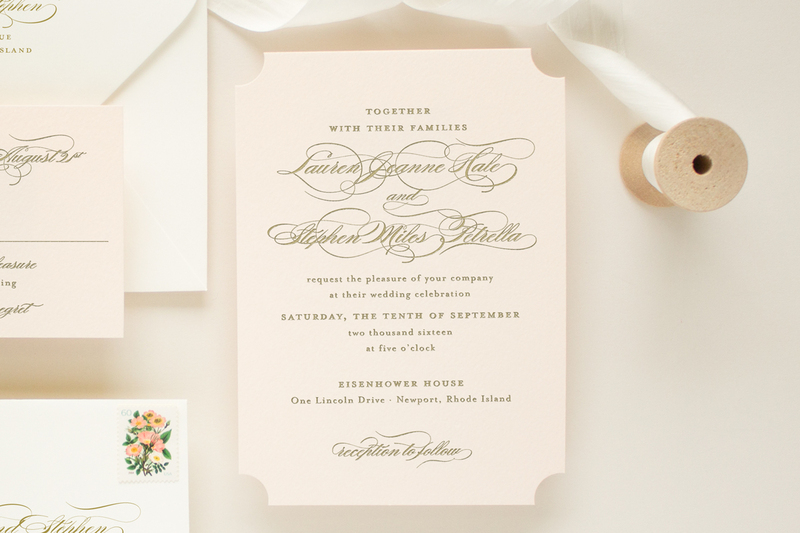 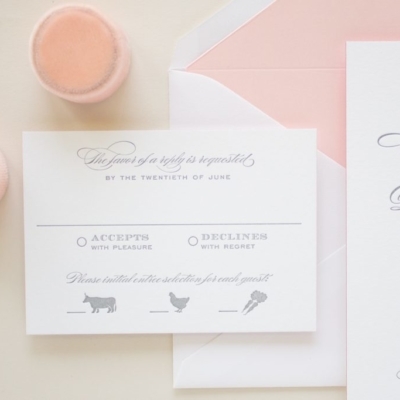 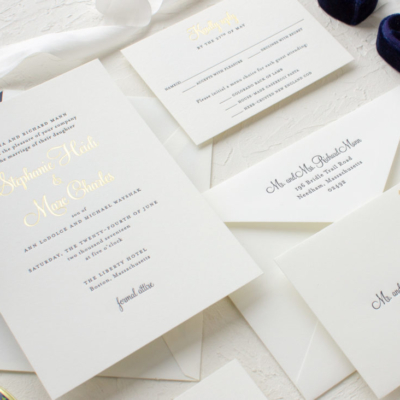 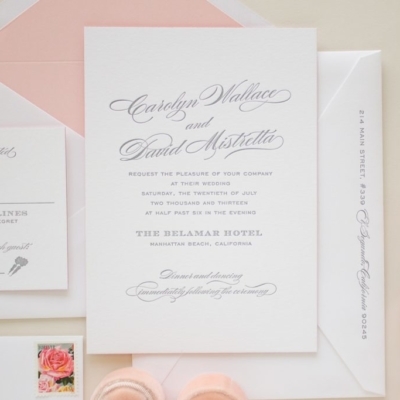 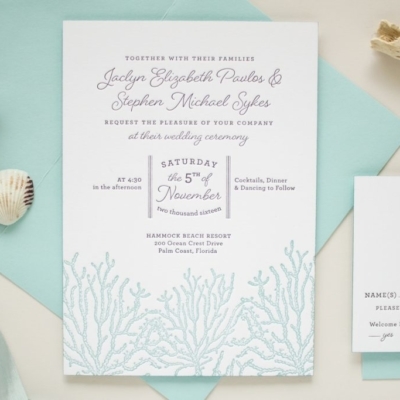 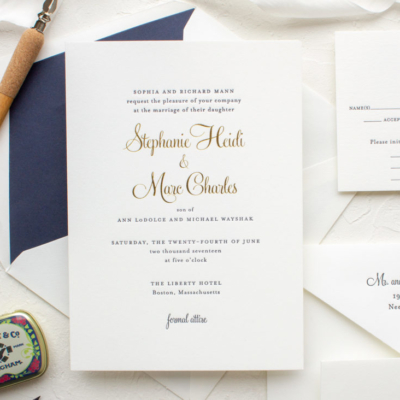 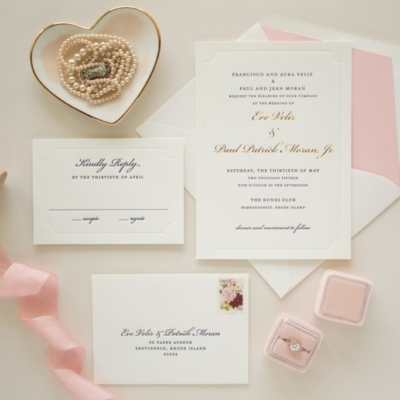 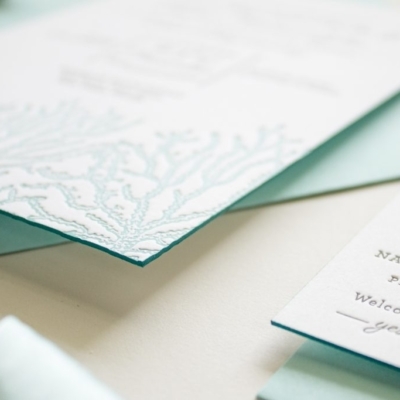 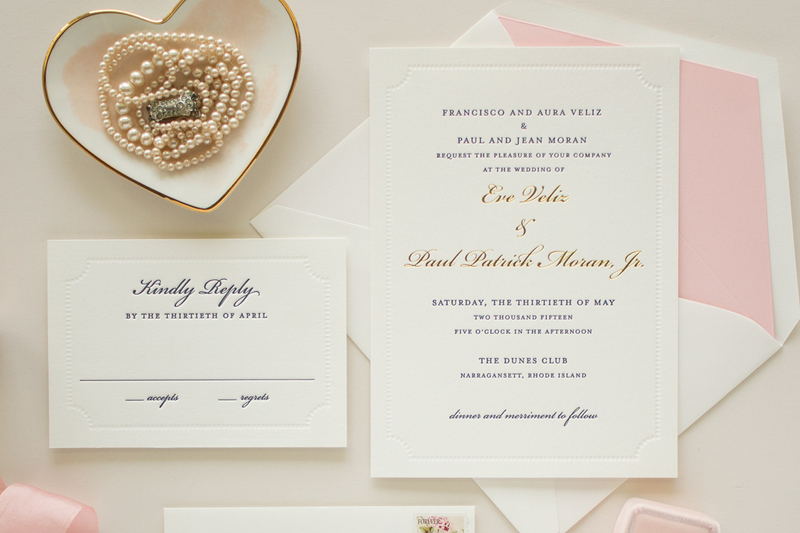 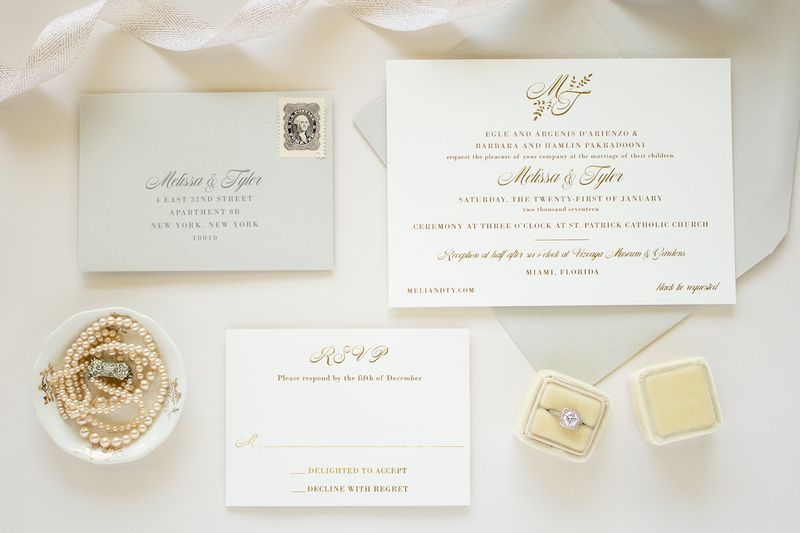 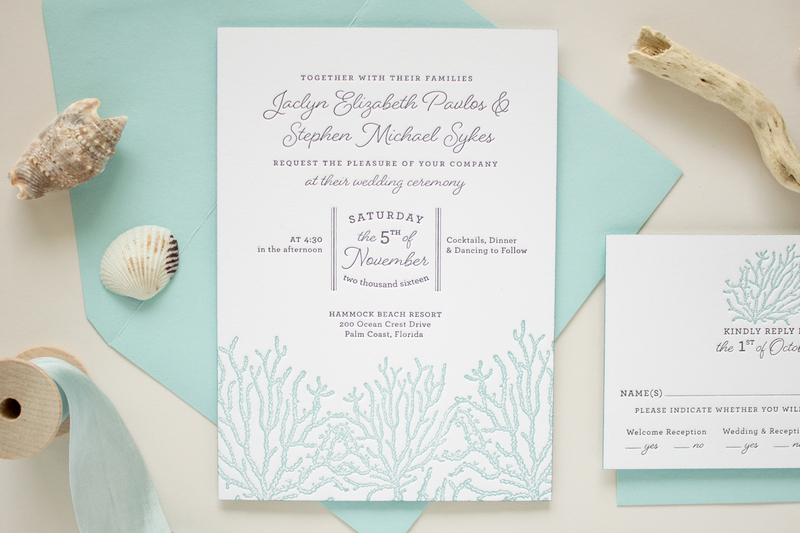 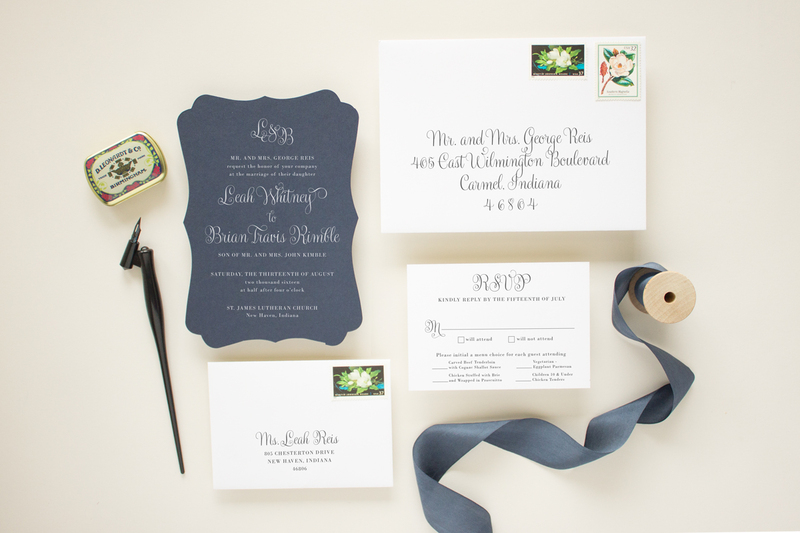 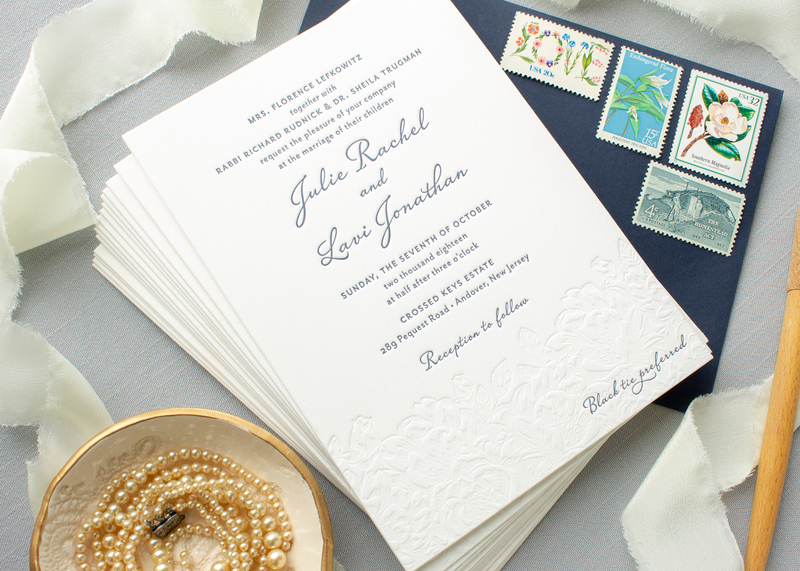 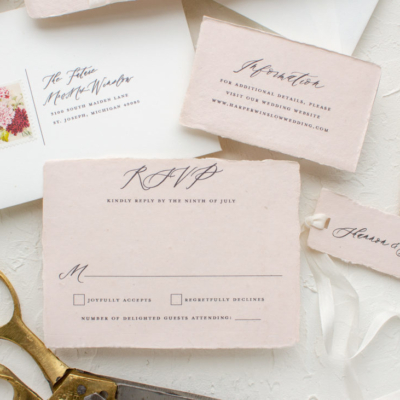 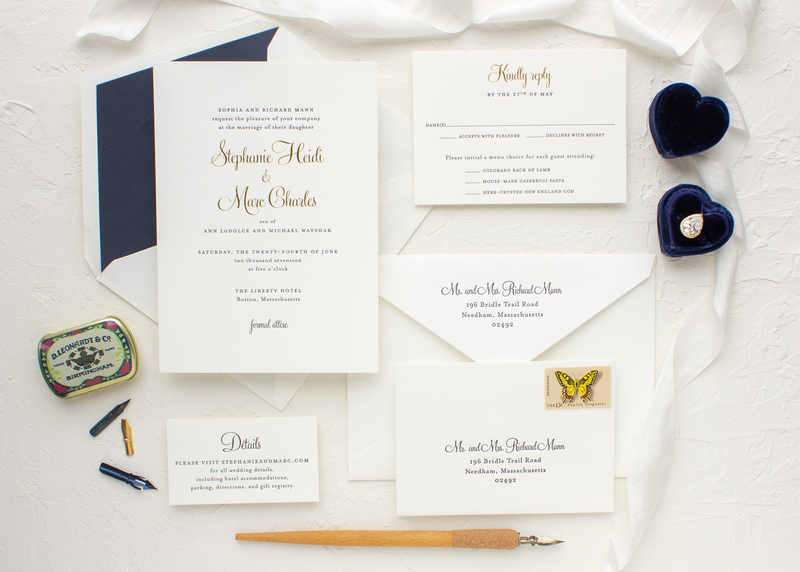 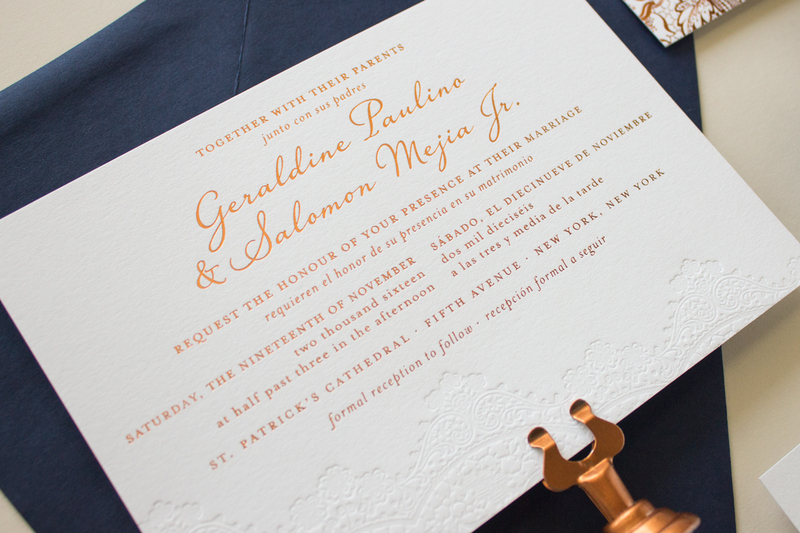 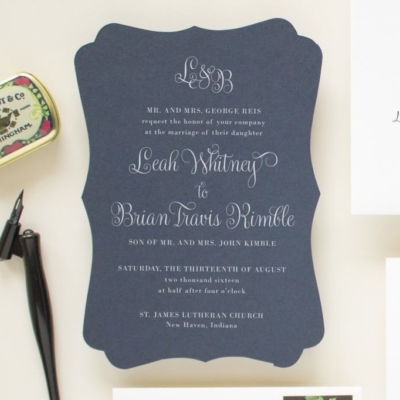 But maybe you want an invitation design tailored specifically to your wedding location. 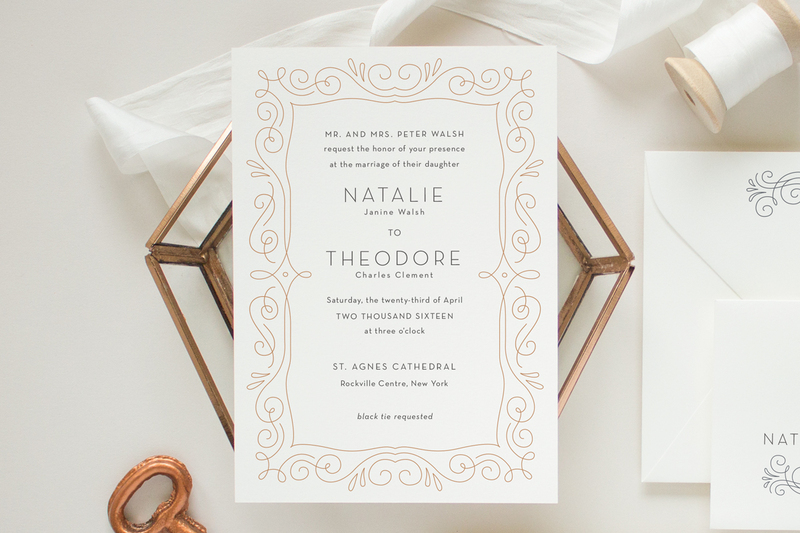 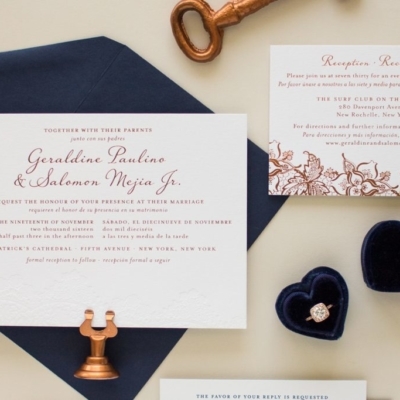 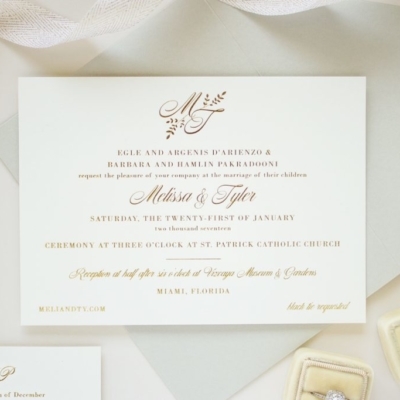 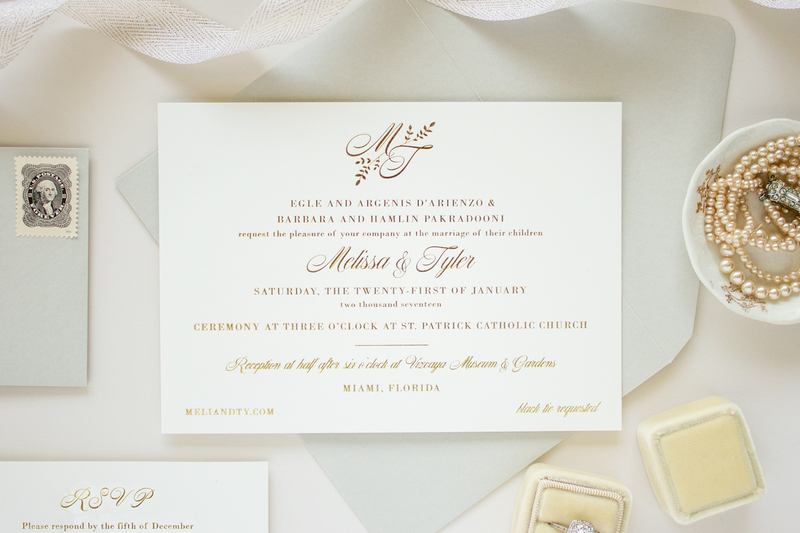 You want an invitation design that is classy and timeless, but not ordinary. Perhaps you have a special size or shape in mind or would like to incorporate a symbol that represents a significant moment in your relationship. 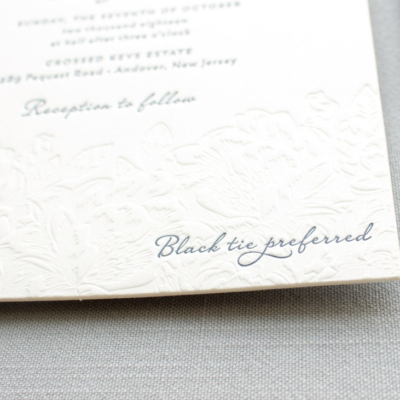 In that case, bespoke is the way to go! 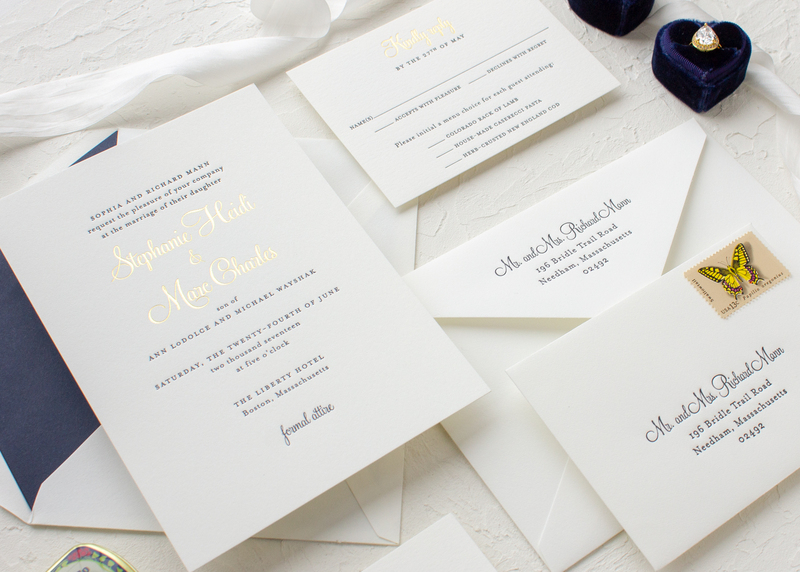 Whether you choose a collection design or bespoke design, I will be working one-on-one with you to create the invitation of your dreams. 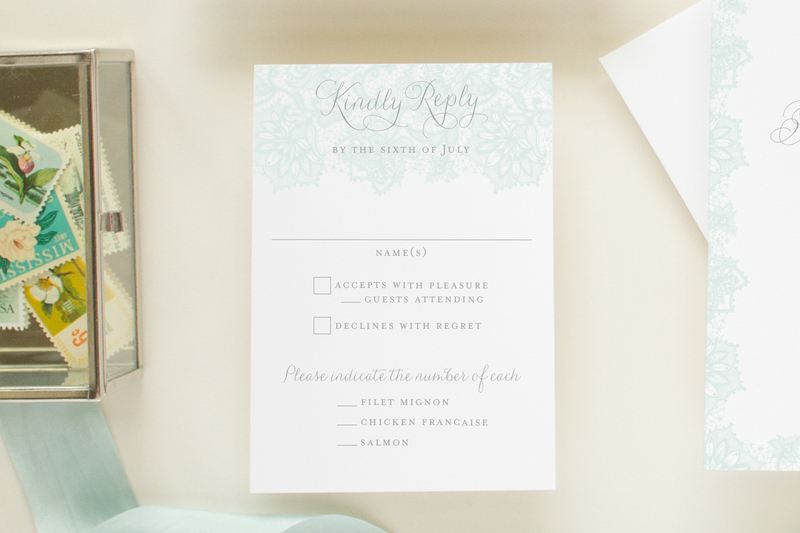 We’ll start by getting to know each other. 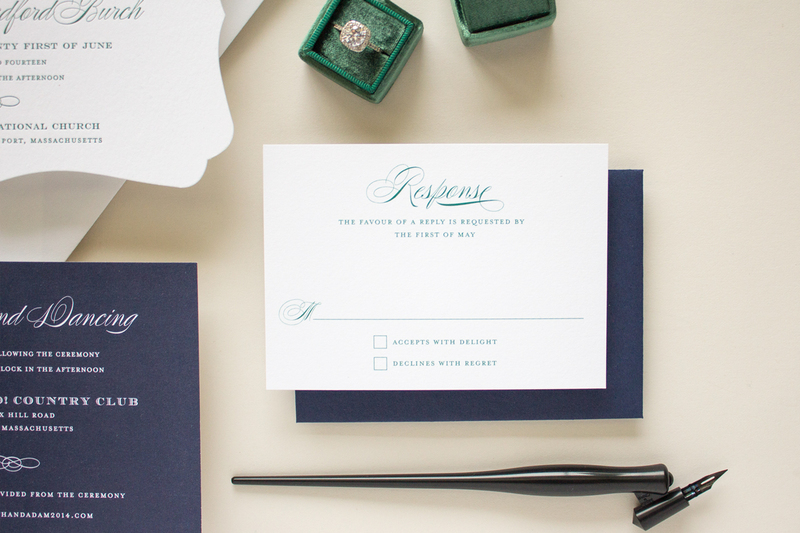 Tell me how you met and where you got engaged. 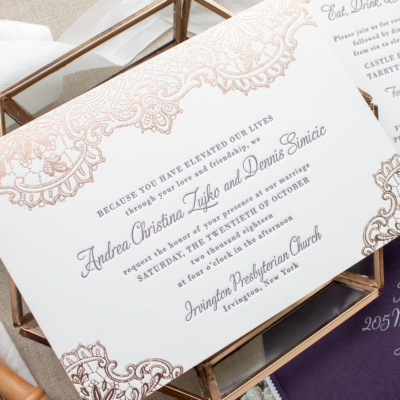 Is the wedding going to be in a small chapel or a cathedral? 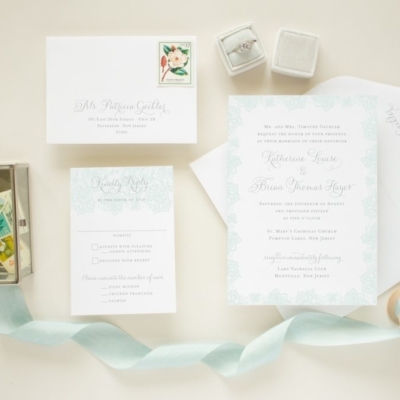 Send me your pinterest boards* and magazine clippings, and I’ll mail you paper swatches and ribbon samples. 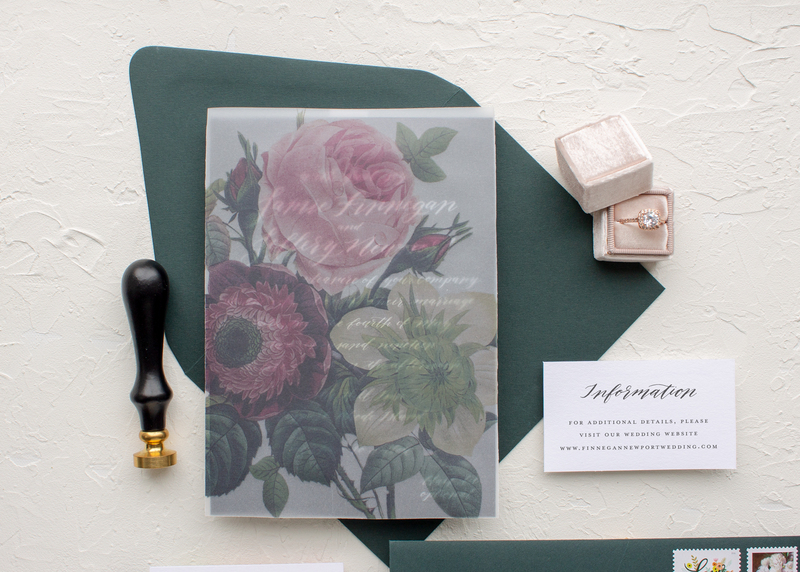 We’ll collaborate to create a stunning paper suite tailor-made for you. 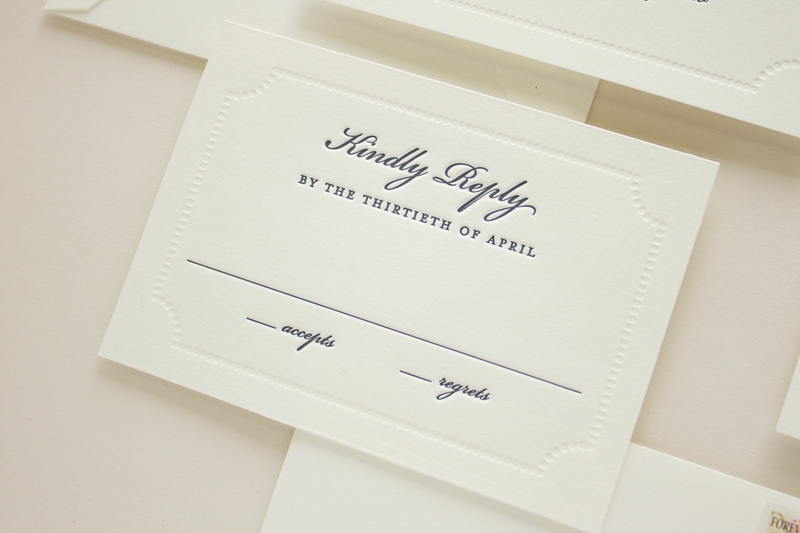 While I’d like to create bespoke wedding invitations for every couple, it’s a good idea to make sure our aesthetics match up first. 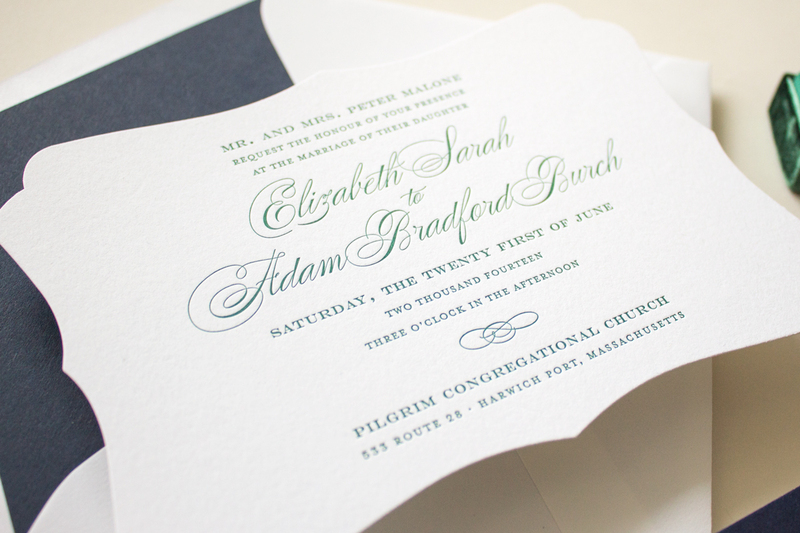 My specialty is classic and traditional designs with elegant typography and minimal accents. 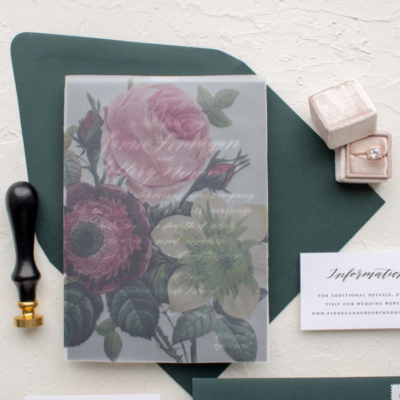 Now that doesn’t mean I never step out of my comfort zone, but if you are looking for lifelike portraits or something with an ultra-modern vibe, we may not be a good match. 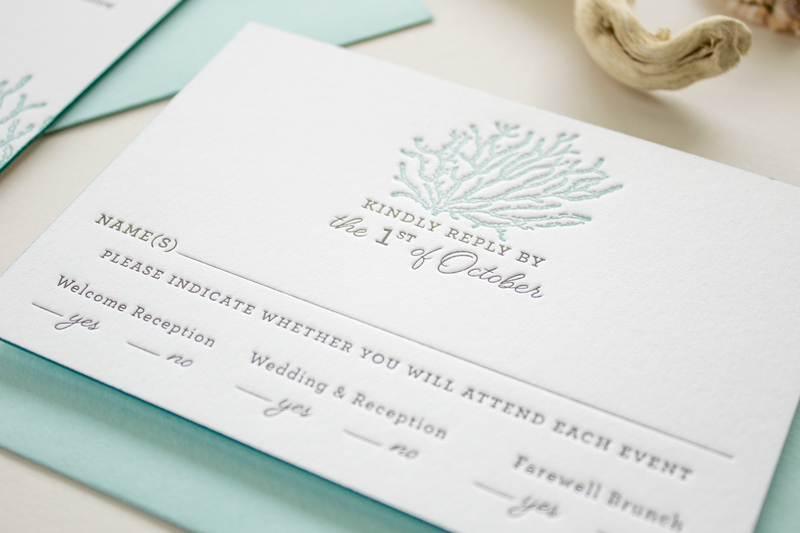 *I’d love to see any invitations that caught your eye, but I will not replicate another designer’s work. 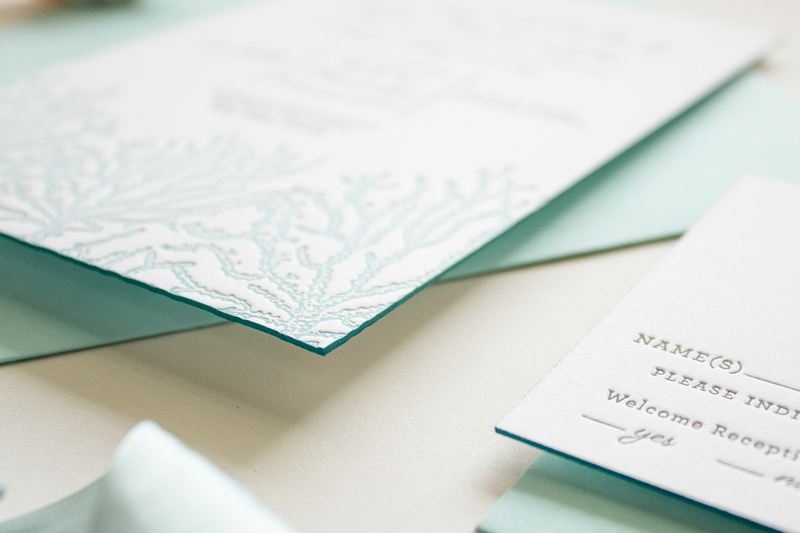 The bespoke wedding invitations featured below are designs I created for previous Banter & Charm clients. 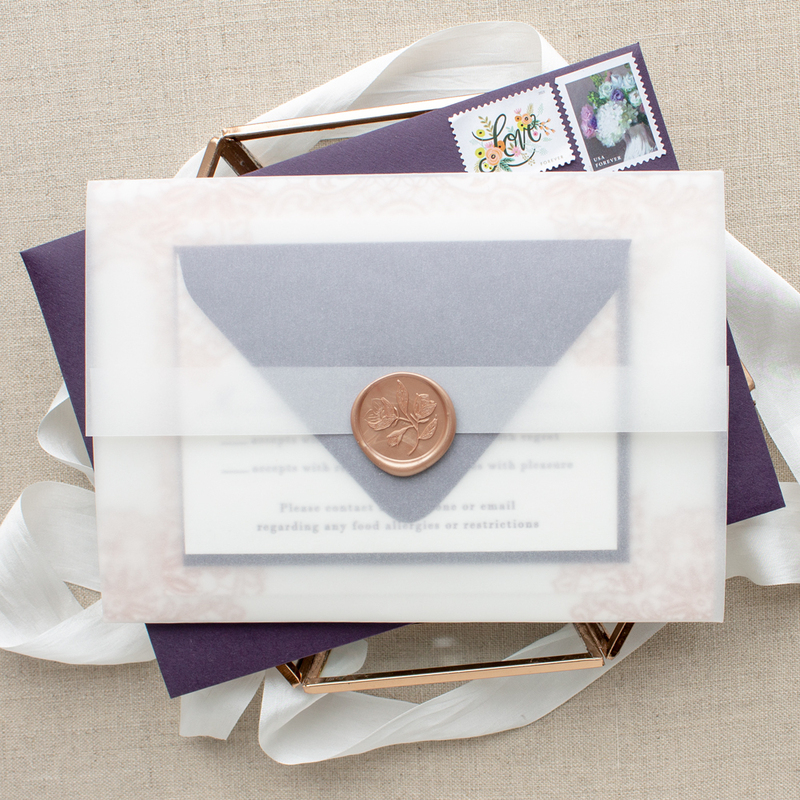 Please get in touch so I can create a one of a kind bespoke invitation just for you! 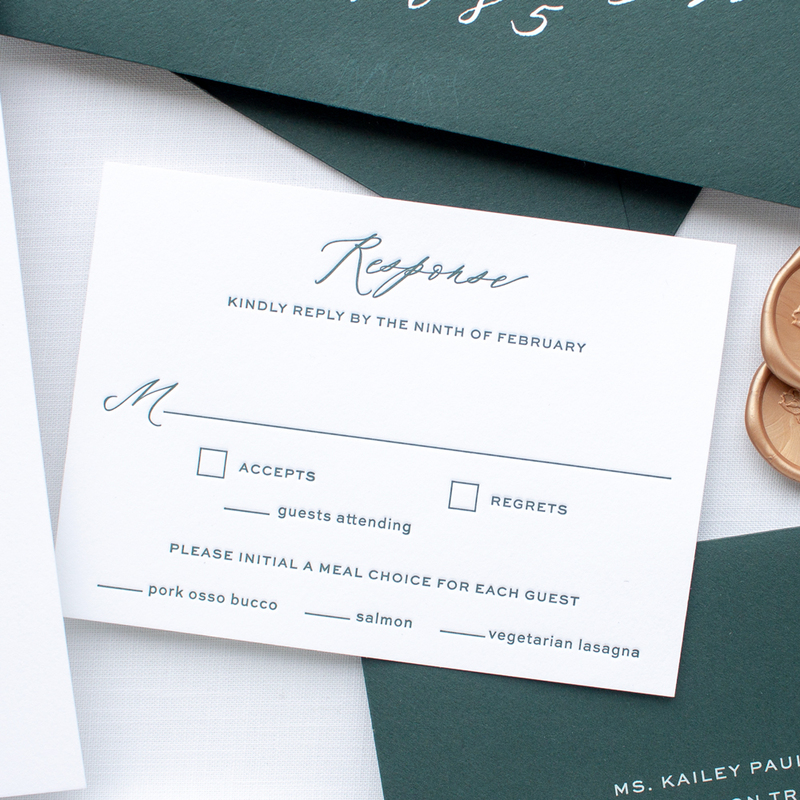 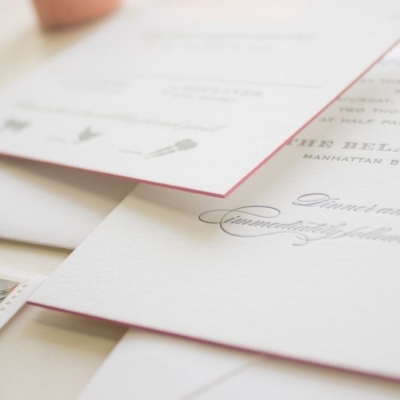 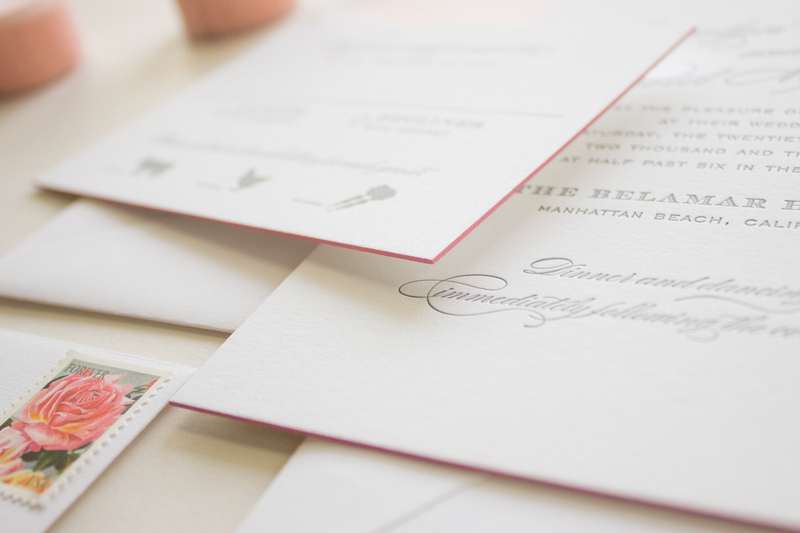 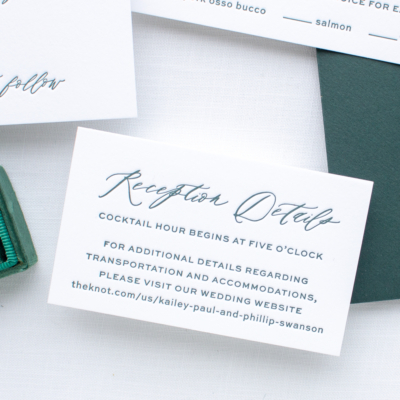 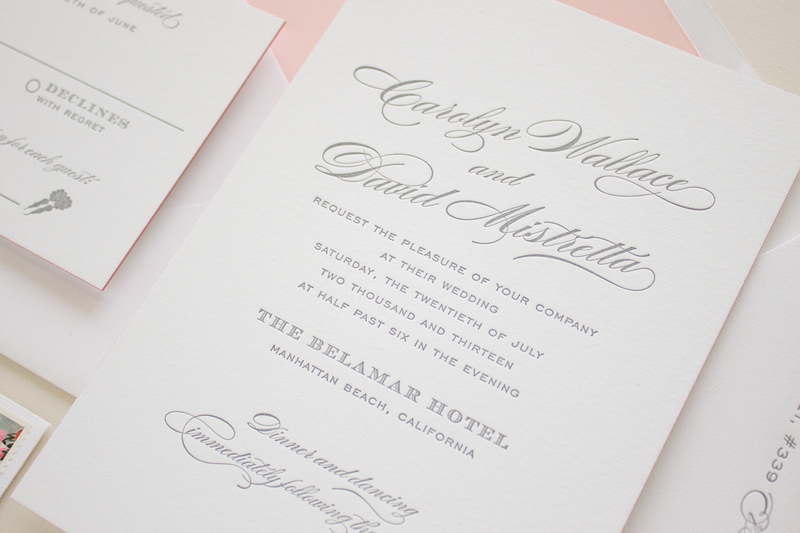 Custom invitation pricing starts at $2000 for a set of 100 in letterpress. 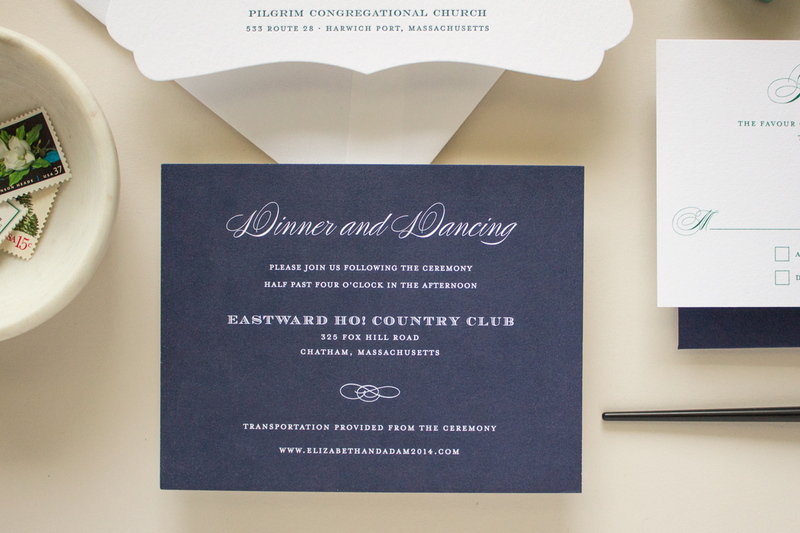 You will be able to create your own package by selecting the items, print methods, and options that fit your event.